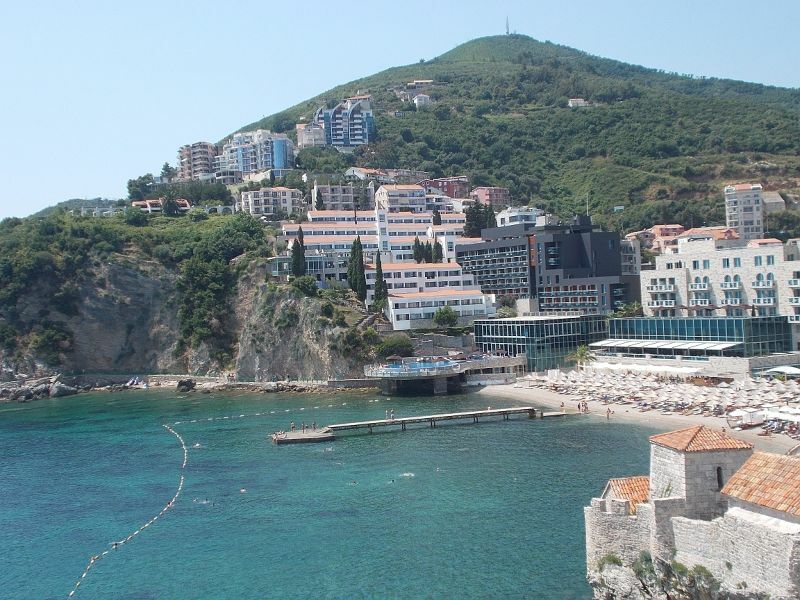 Montenegro - Trips to the Balkans. 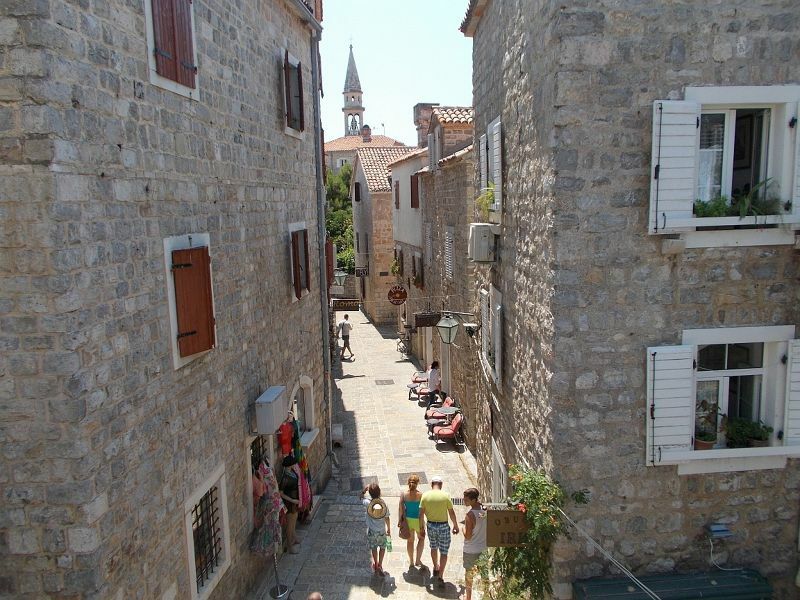 Beautiful old town on the Adriatic. 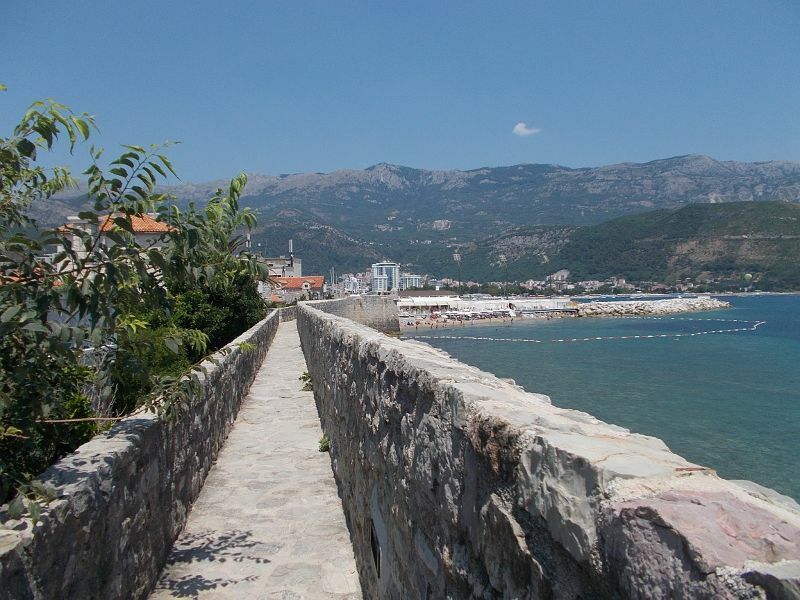 Our original plan was to try and do day trips to Cetinje and Budva from Podgorica, but we spent more time in Podgorica than we had intended, so we ended up just doing the day trip to Budva. 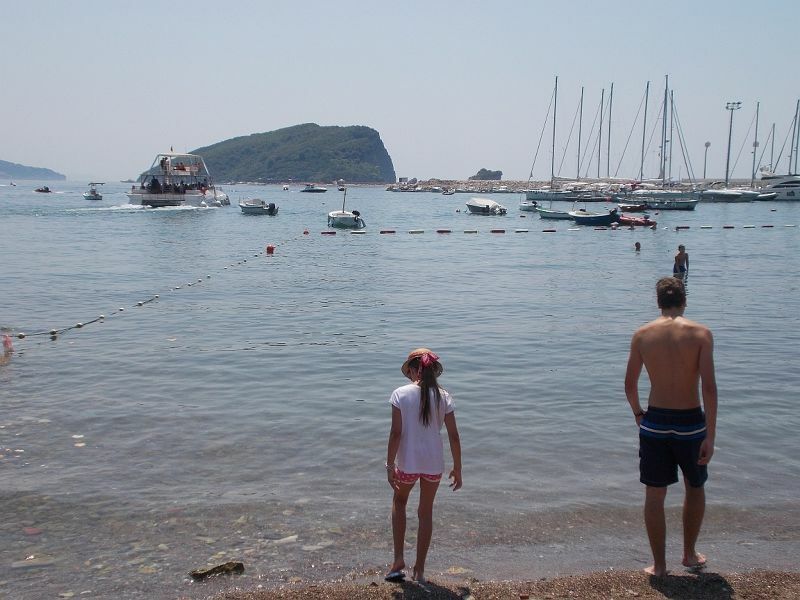 We got to Budva by bus. 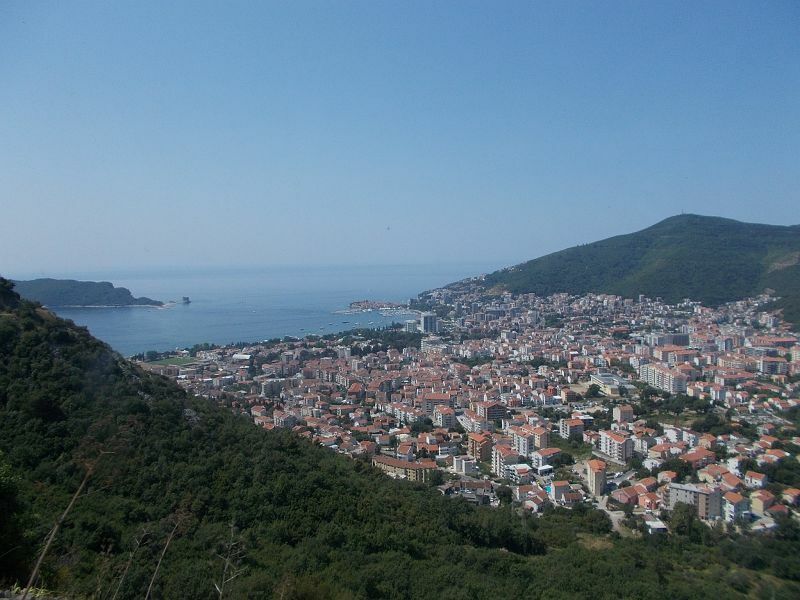 The scenery on the way was beautiful: lots of mountains, a hilltop castle, a beautiful view over the rooftops of Cetinje and as we neared Budva great views over the town. 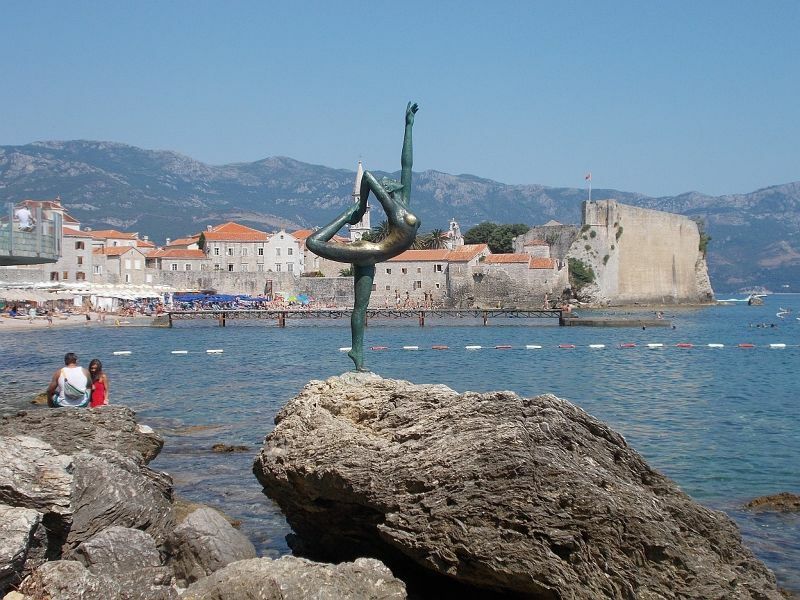 Budva has a lovely, but small old town, a famous statue and lots and lots of beaches. It also has a sizable, but not very remarkable new town. 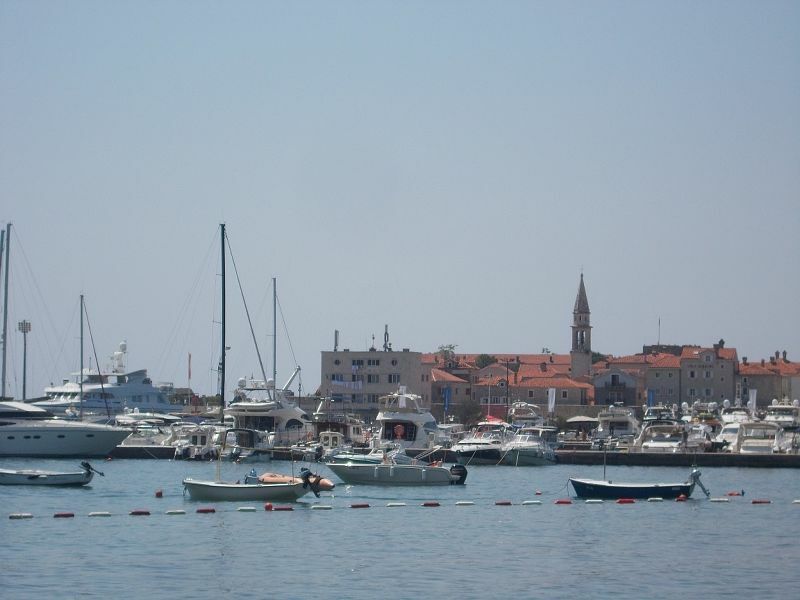 We looked at the old town and the statue and had a very refreshing swim in the wonderfully cool Adriatic Sea. 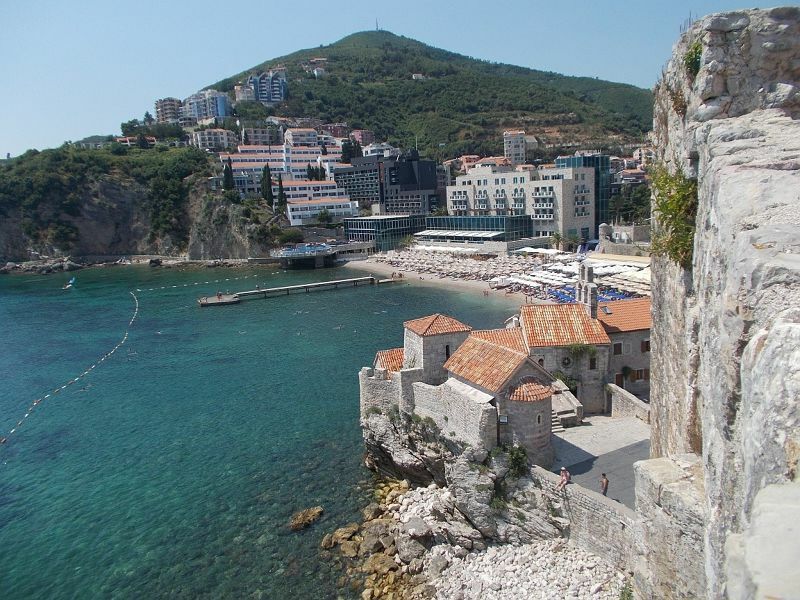 Budva is believed to be one of the oldest settlements on the Adriatic Coast. 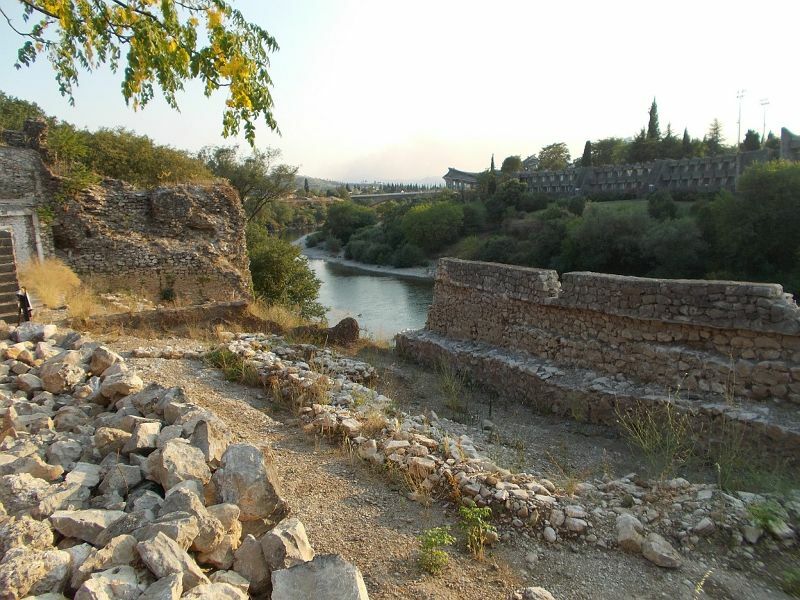 According to legends it was founded by a Phoenician prince, Cadmus and his wife Harmonia after they fled from Thebes. 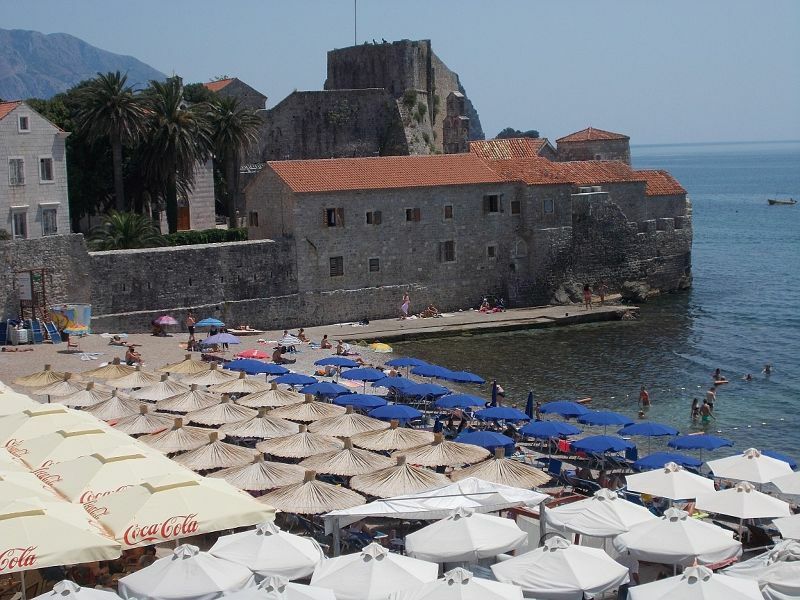 Budva was under the control of the Byzantines from the beginning of the sixth century until the twelfth century. 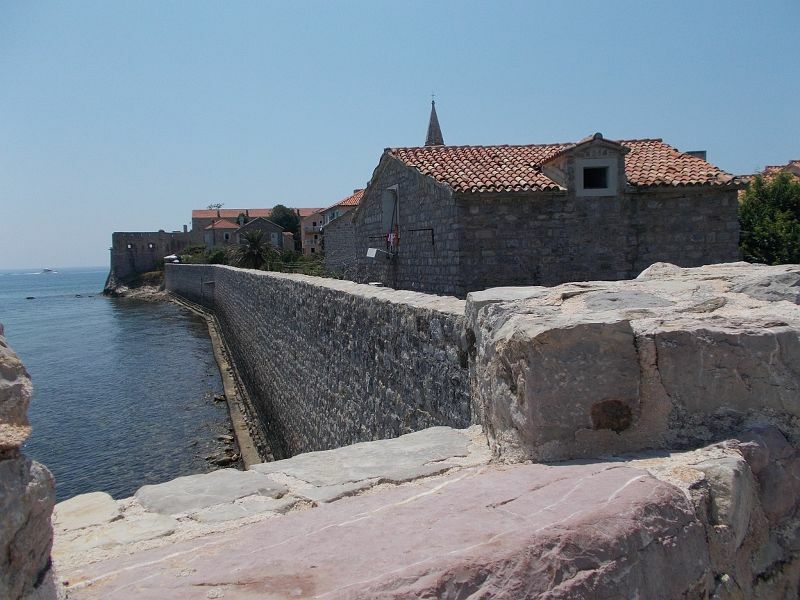 After that it was under Serbian control until the Venetians took over at the beginning of the fifteenth century. 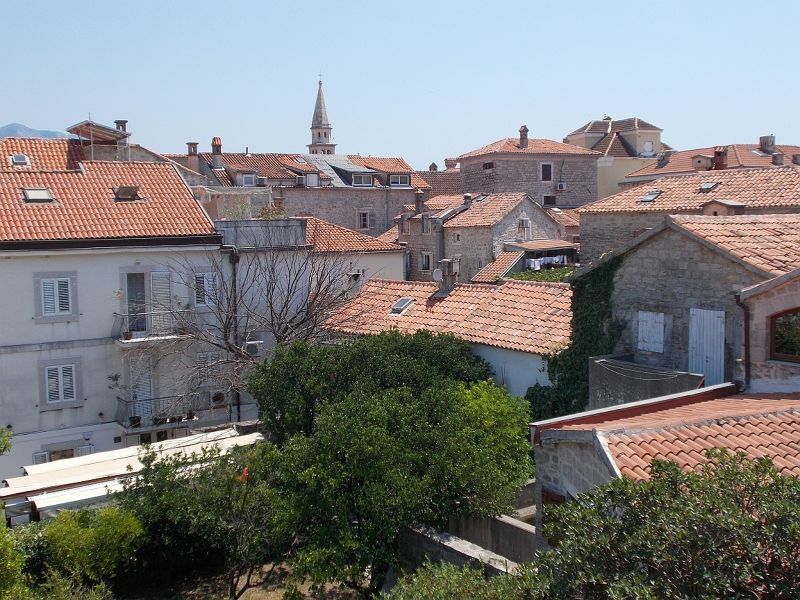 Most of the buildings in the old town were built during the Venetian Period. Just before the marina there was a little beach. 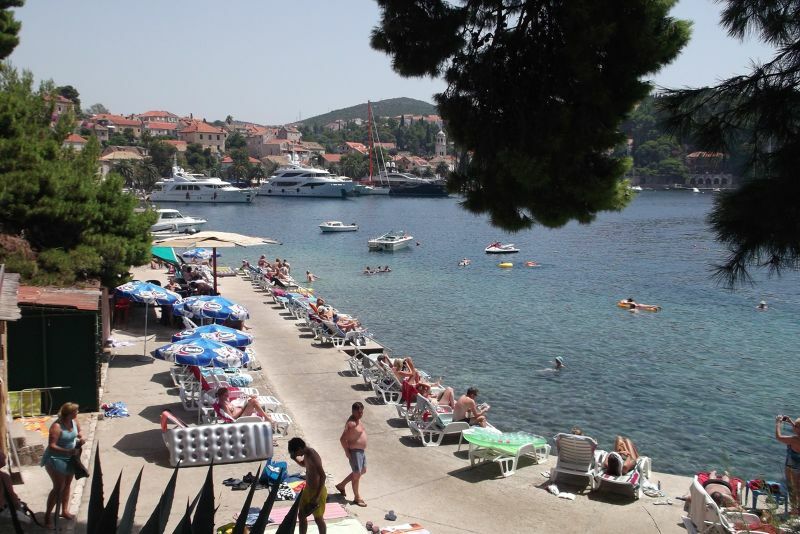 We had a very pleasant swim there on our way back to the bus station. 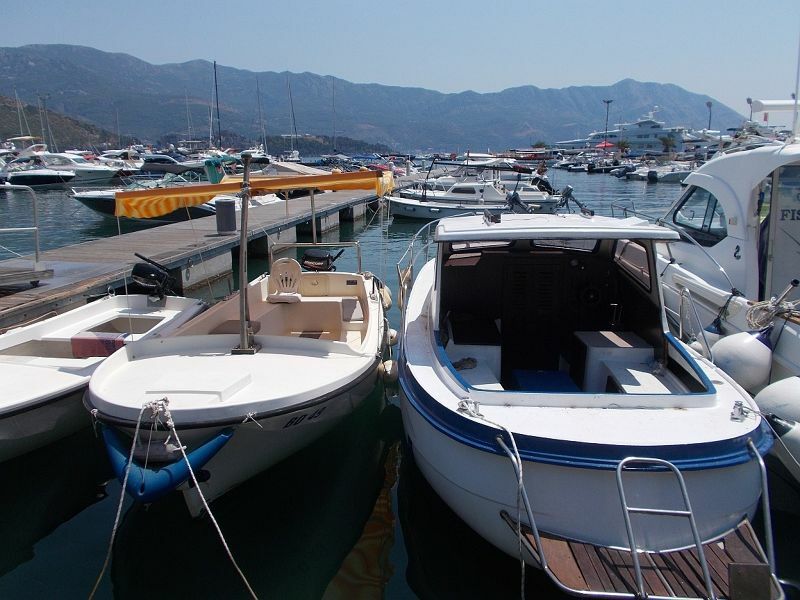 The marina itself is a mixture of fishing boats, boats offering cruises to tourists, pleasure crafts and boats that take you across to Sveti Nikola Island - a beach resort nicknamed Hawaii by the locals. 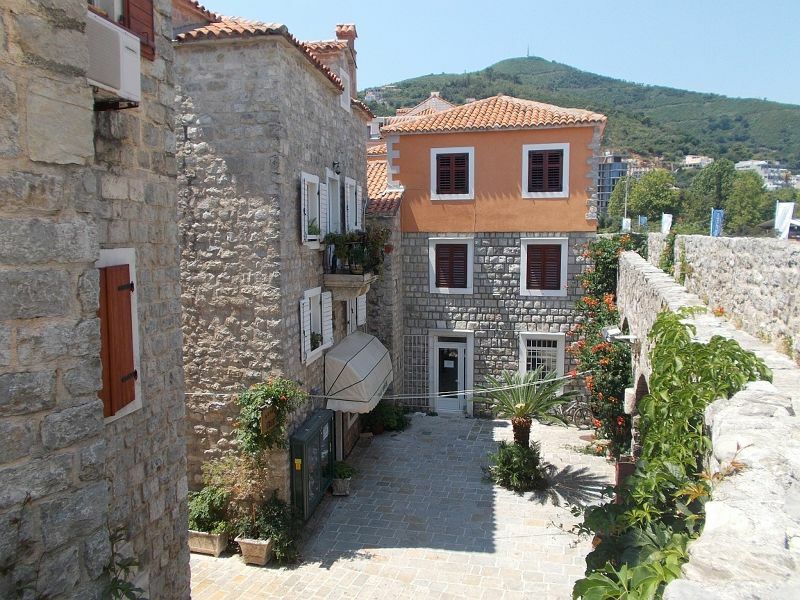 Budva old town is a walled town with several gates. 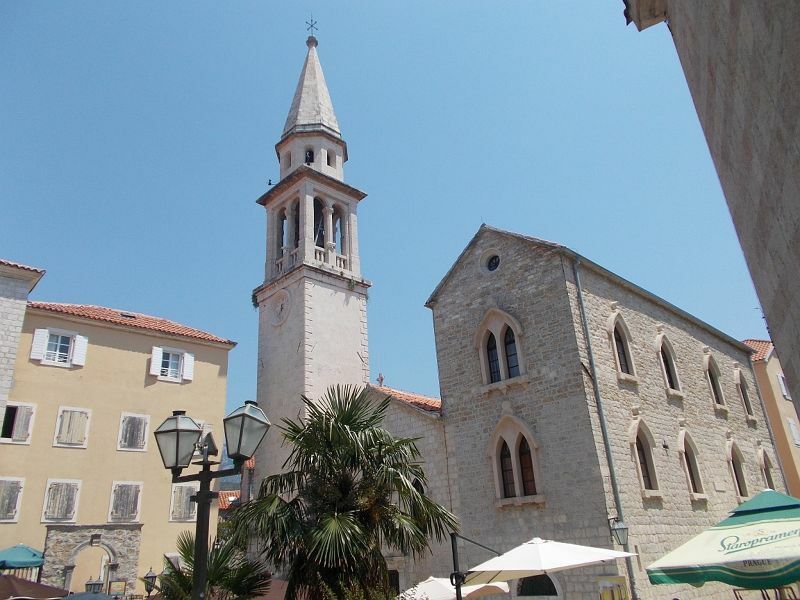 It has a main square, Trg og Crkava, home to several churches and the citadel. 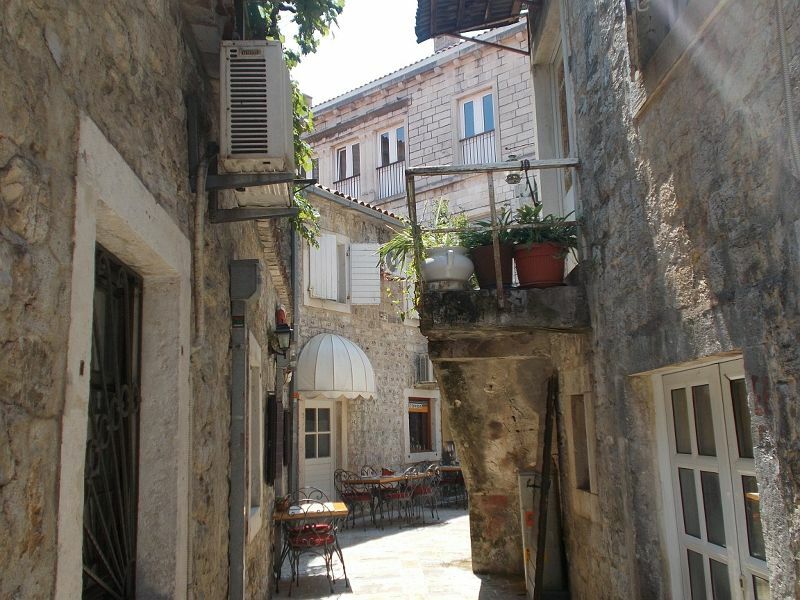 It also has some beautiful old narrow streets. 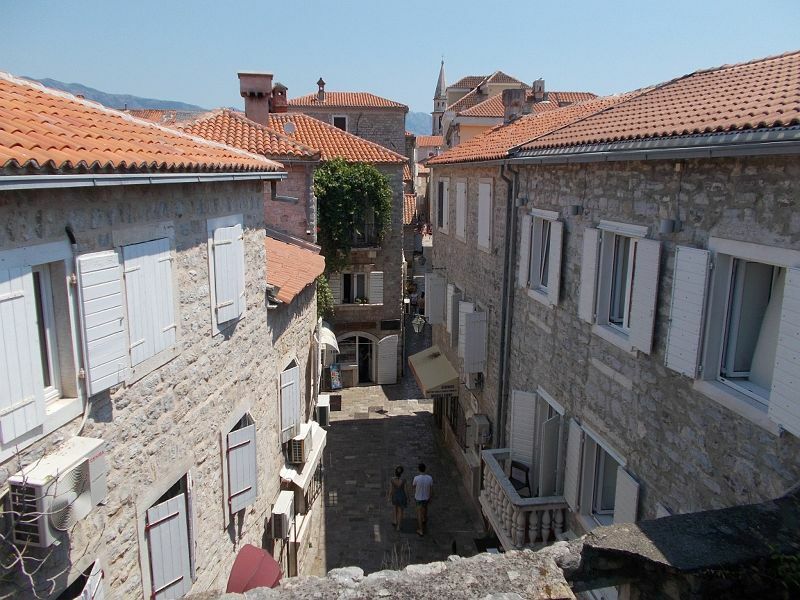 It is not a huge old town, but it is well preserved. There are plenty of restaurants, cafes and bars here, too. 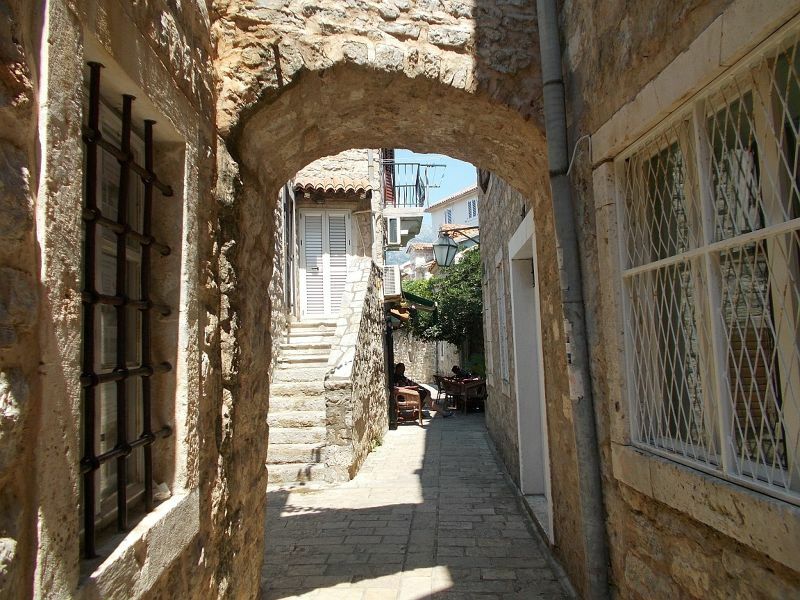 One of the highlights of the Old Town is just wandering aimlessly around the narrow old town streets. You can get a different perspective of them if you walk the city walls. 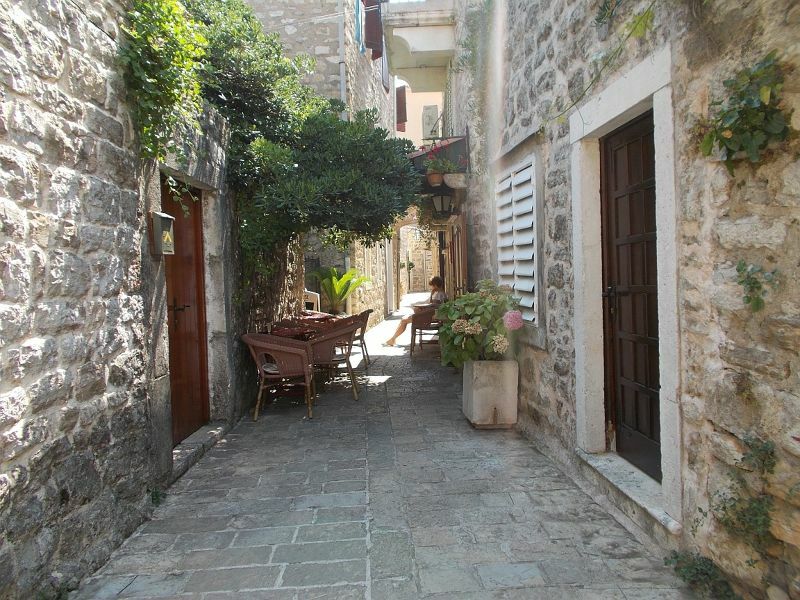 Despite the influx of tourists, the streets are peaceful and pleasant for a wander. 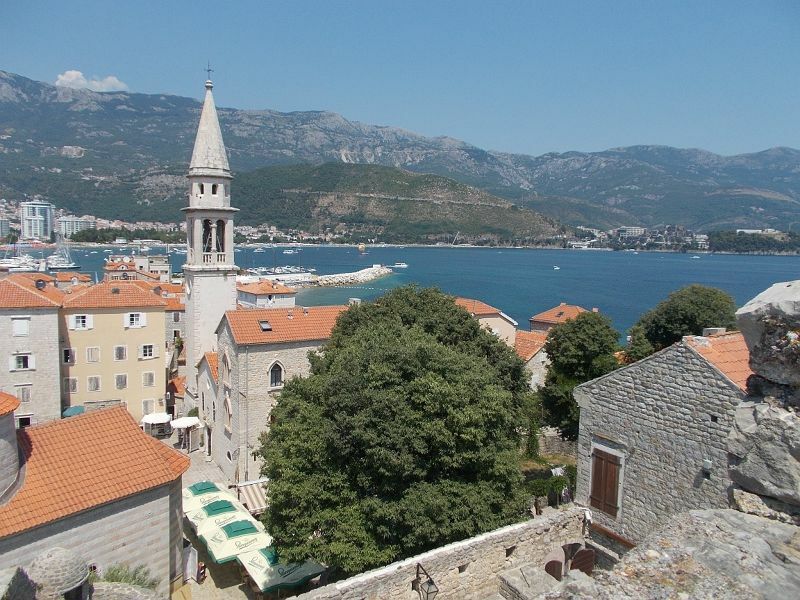 I paid 3 Euros to visit the citadel of the Old Town. This was built by the Austrians in 1836. 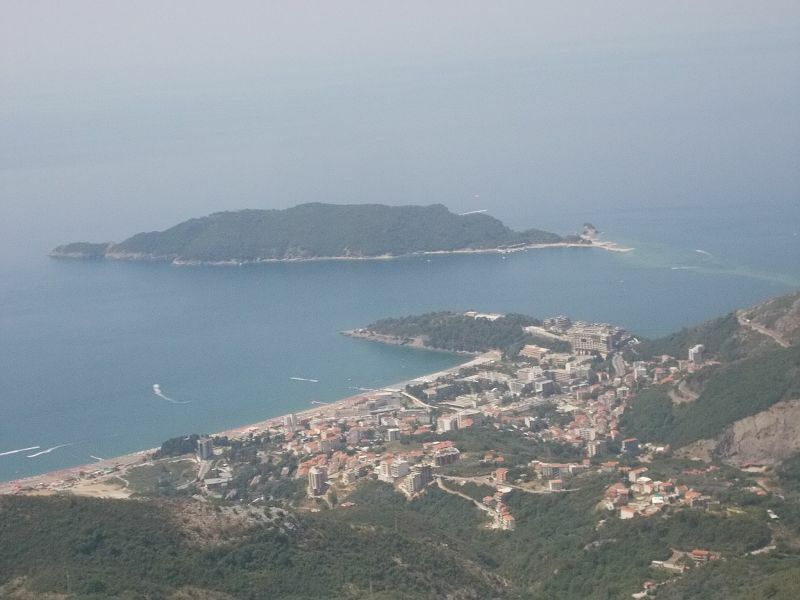 The best bit about the citadel are the views from it over the sea, the Island of Sveti Nikola and the new and old towns of Budva. 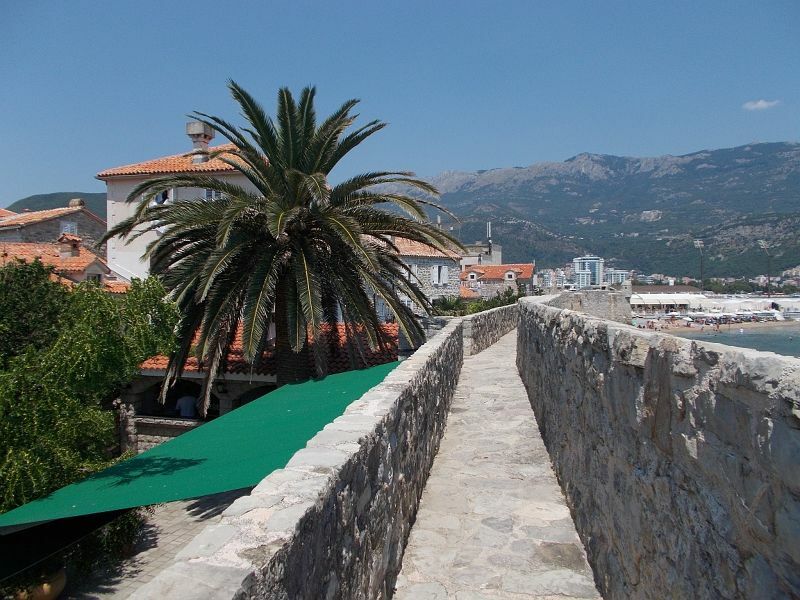 Inside the citadel there was a small library and some exhibits ab!out the history of Budva. 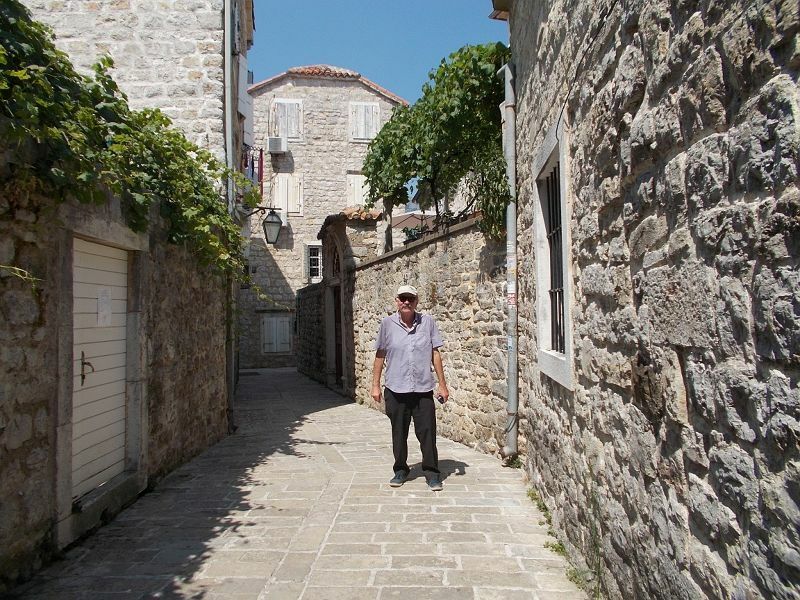 I paid 1Euro 50 cents to walk the walls of Budva's old town. This takes around 20 minutes. You cannot walk all the way round. The views from the walls are lovely. 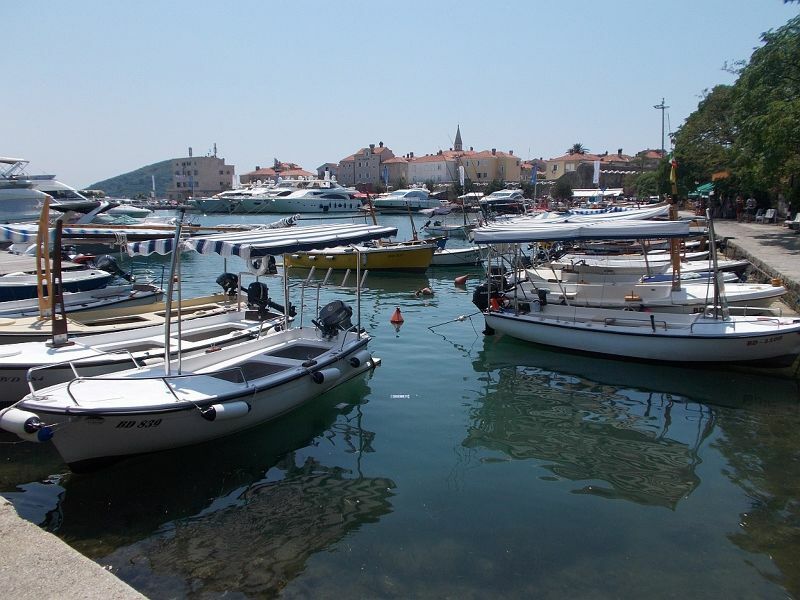 You can look out towards Sveti Nikola's Island, look out across the marina or look inland across the colourful narrow streets of the old town. Town's churches. 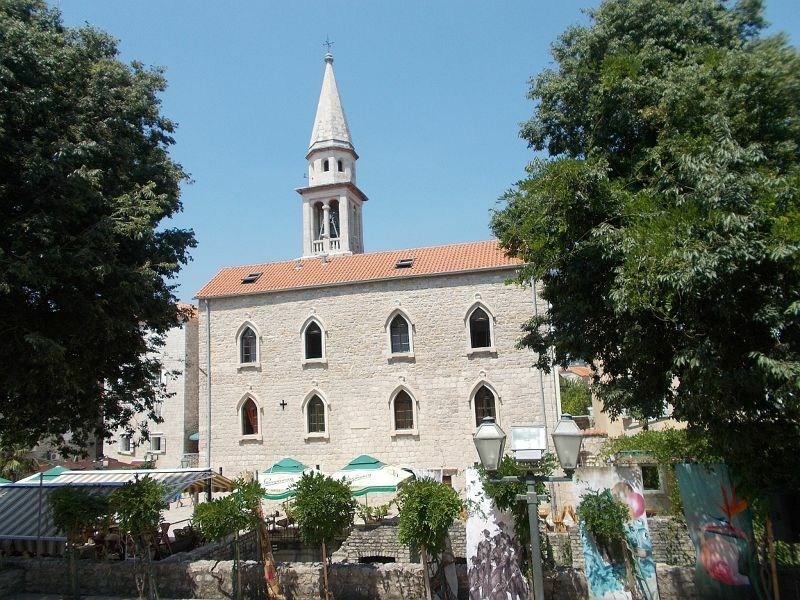 Also in this square you can find the Church of Saint Mary of Punta, which was built on the site where Spanish sailors placed an icon of the Virgin Mary and two burning candles. 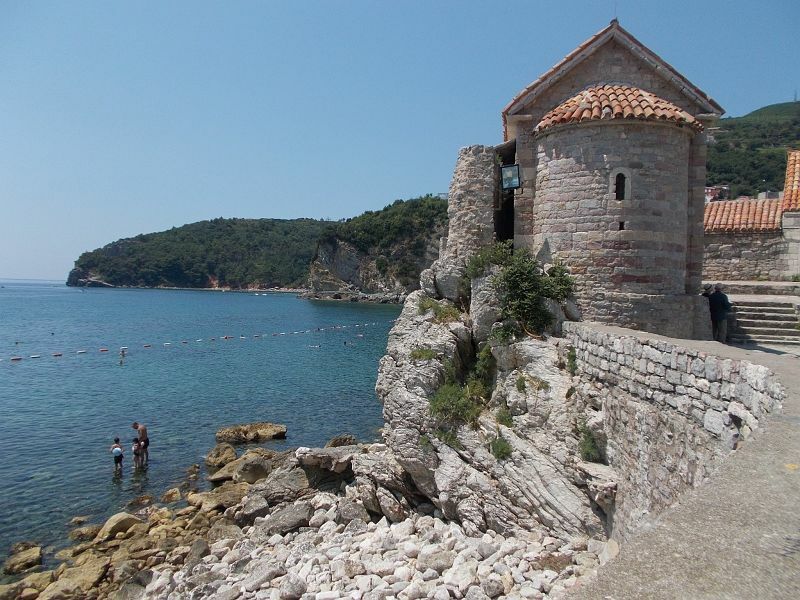 The Church of Saint Sava, like the Church of Saint Mary of Punta, forms part of Budva's fortifications. 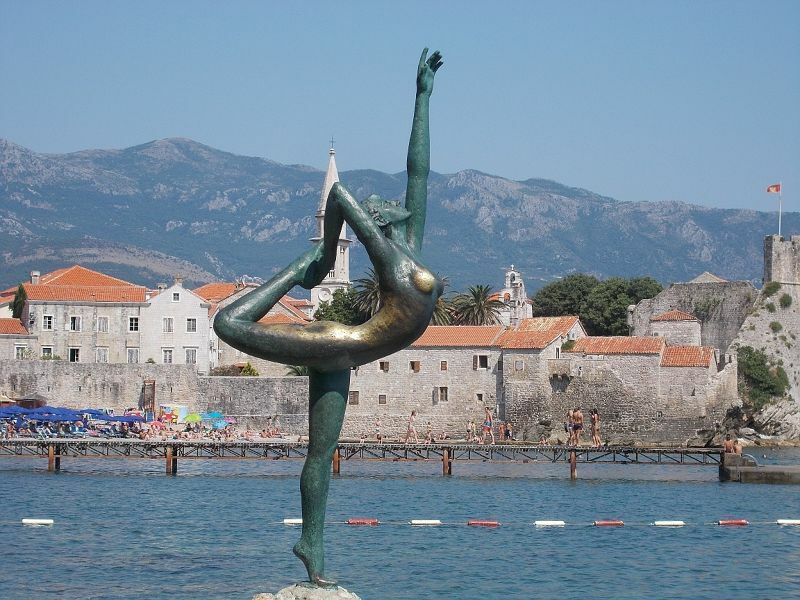 We walked away from the Old Town on the opposite side from the marina and the bus station and, as we wandered along the coastline walkway, we encountered the beautiful, graceful dancing girl statue. She stands on a rock and the more flexible among us may have a go at joining her and imitating her pose. My husband had a go too just to keep us less flexible folk in the picture, too. 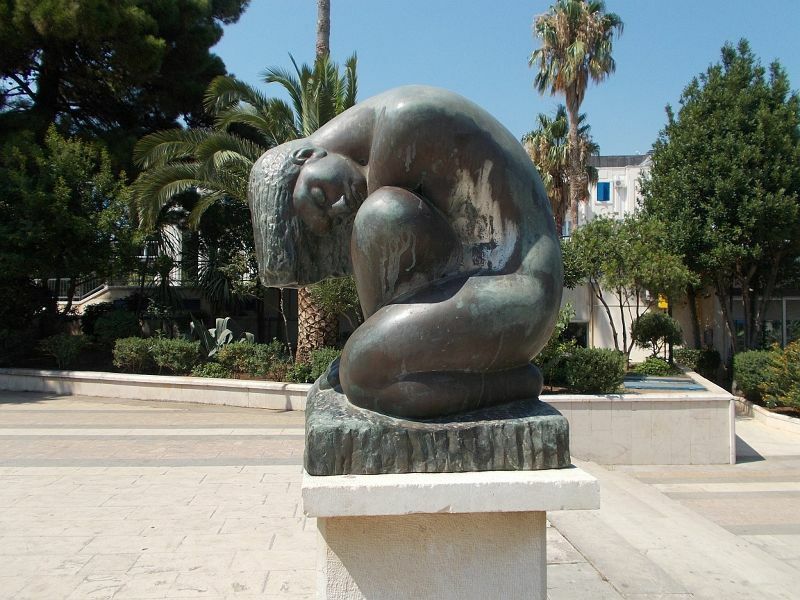 No-one knows the true history of the statue, though legends claim she was the daughter of a wealthy Budva resident who drowned in the sea off Budva. The Prince English Pub: Cosy Bar. 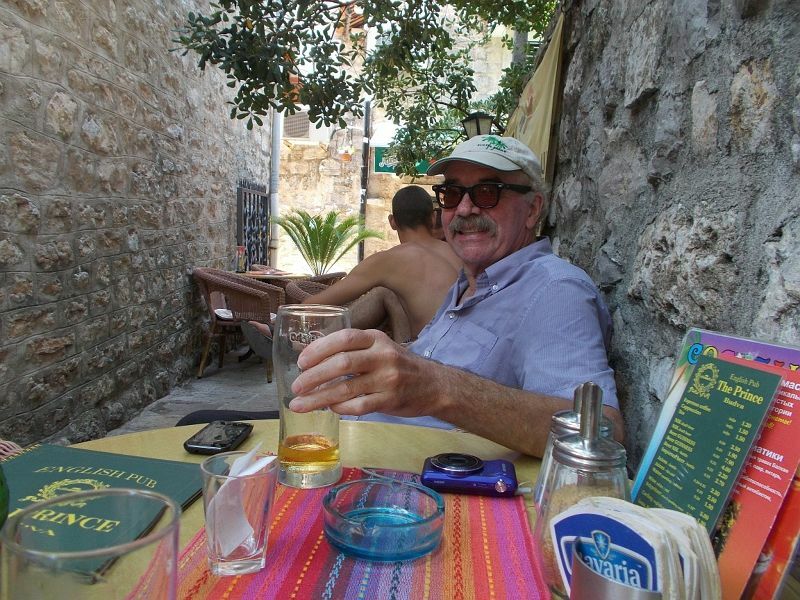 Every day of our stay in Montenegro was incredibly hot, so a nice refreshing drink was very much welcome.We followed the signs for the English pub. It was located down a side street. 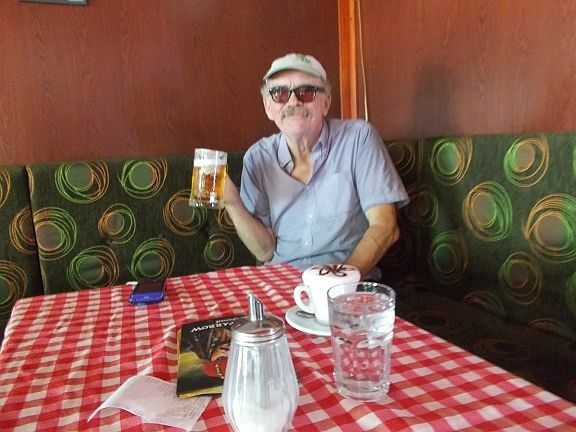 It was a peaceful, pleasant pub with good service. 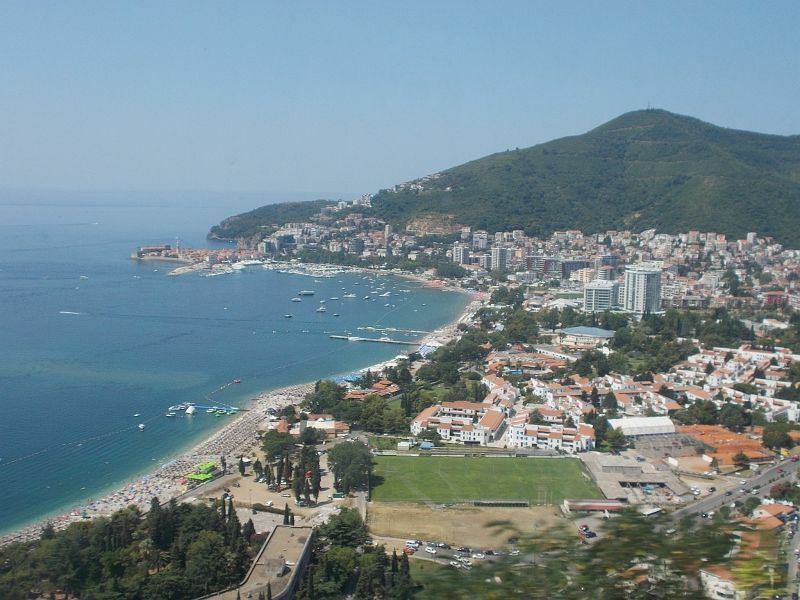 We took the bus from Podgorica to Budva. It was fairly cheap. There are frequent buses. Journey time takes between one and a half and two hours. The scenery on the way was stunning. 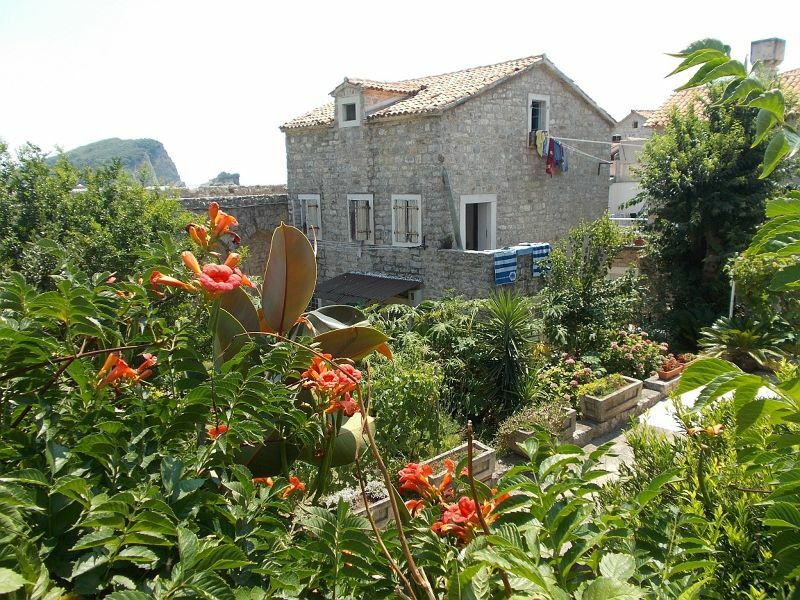 You travel through the mountains and there are great views overlooking Budva as you arrive. A Trip to the Market. 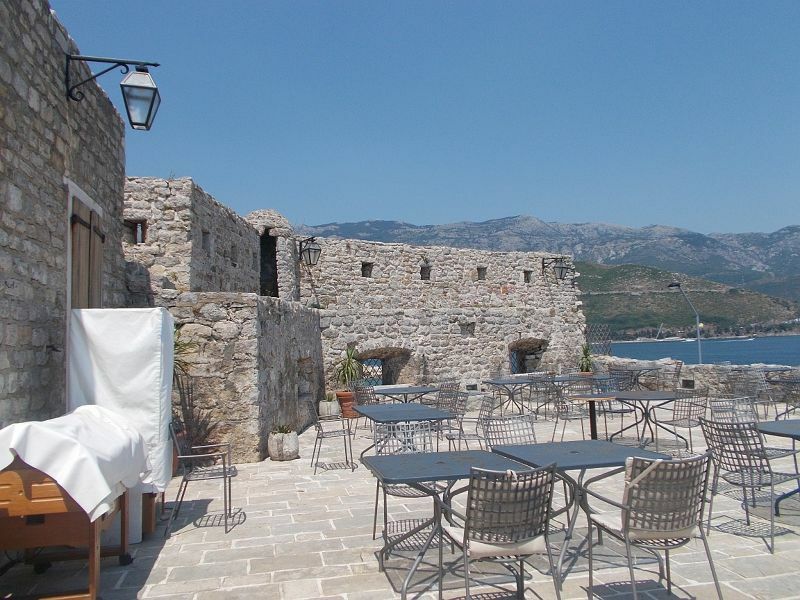 Budva Old Town has lots of cafes, restaurants, bars and souvenir shops. 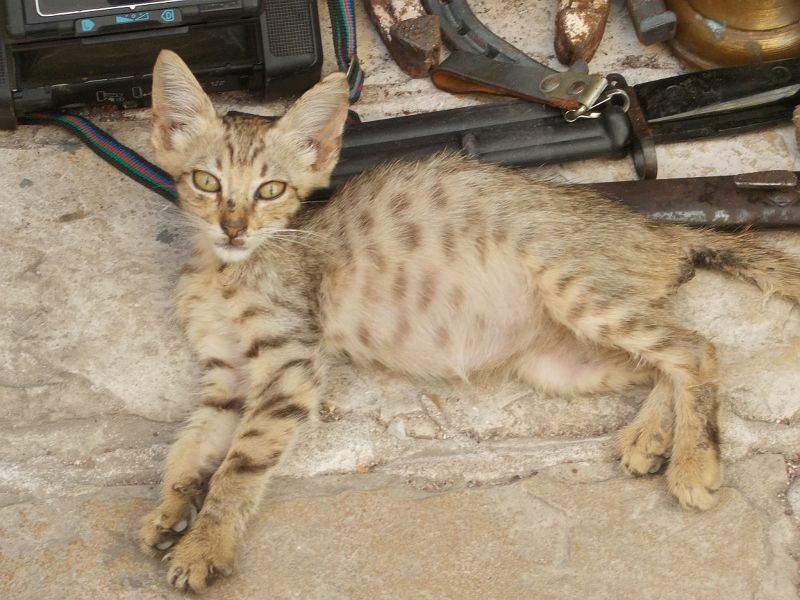 There was also a little market selling lots of souvenirs and bric-a-brac, though the highlight of it for me was the gorgeous kitten which posed for my shots. Capital of the Land of the Black Mountains. 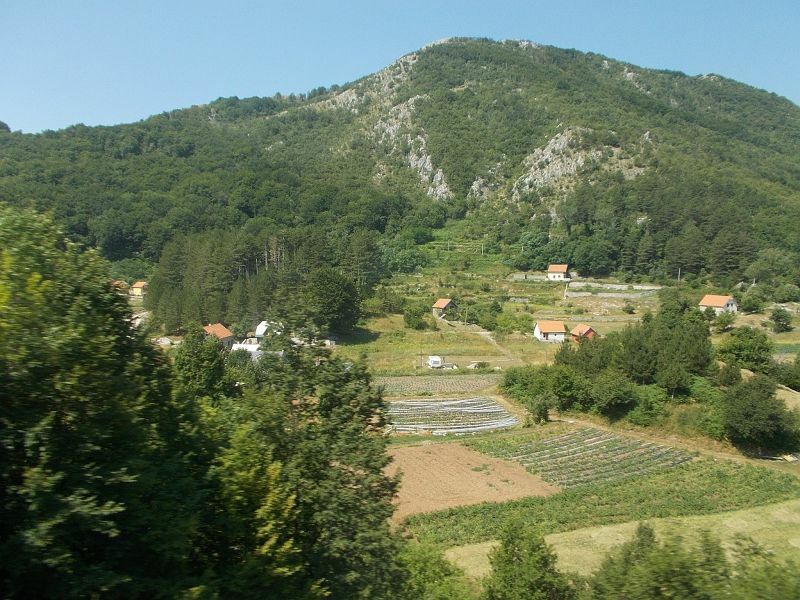 Podgorica is the capital city of Montenegro - the land of the black mountains. 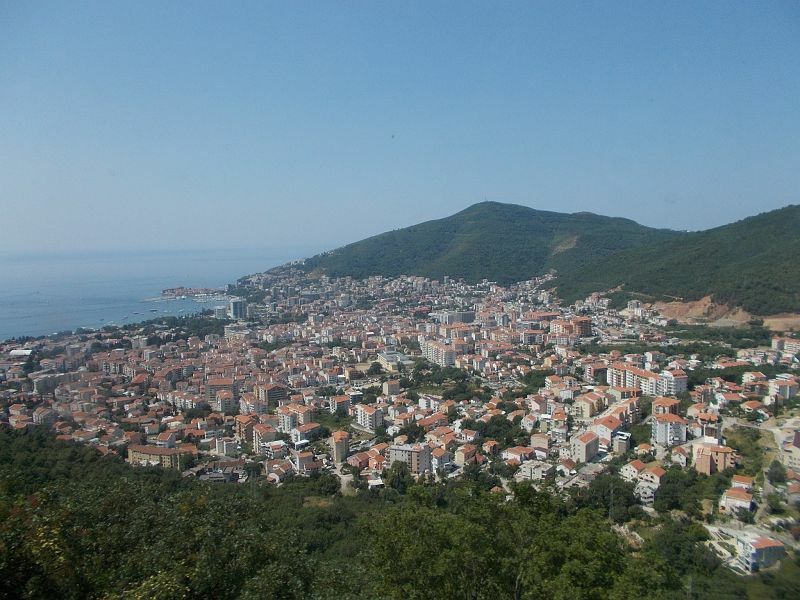 It is also Montenegro's largest city. 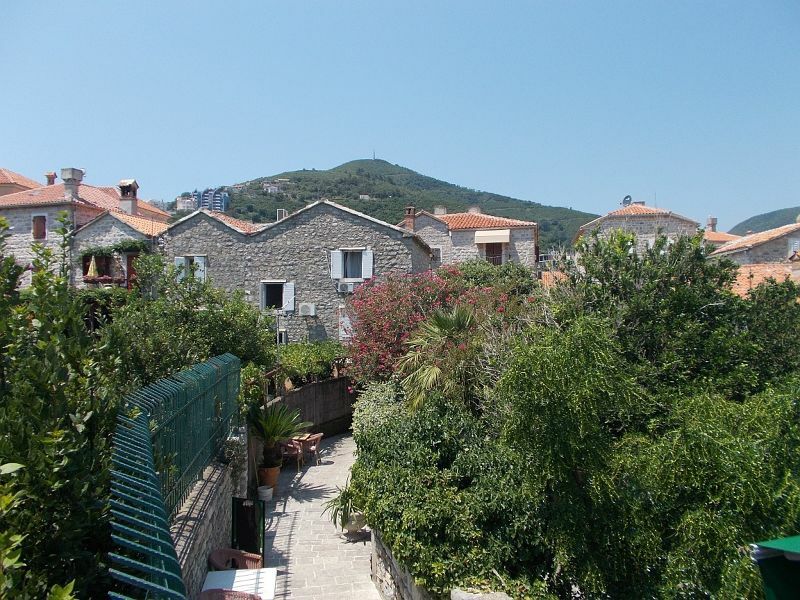 Podgorica means at the foot of Gorica Hill. 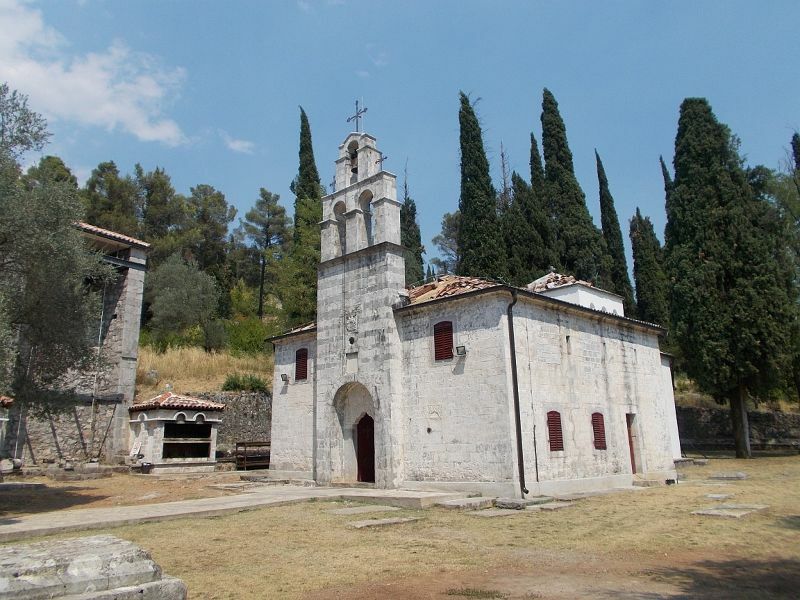 When Montenegro was part of Yugoslavia, Podgorica was called Titograd after the Yugoslavian leader Josip Broz Tito. 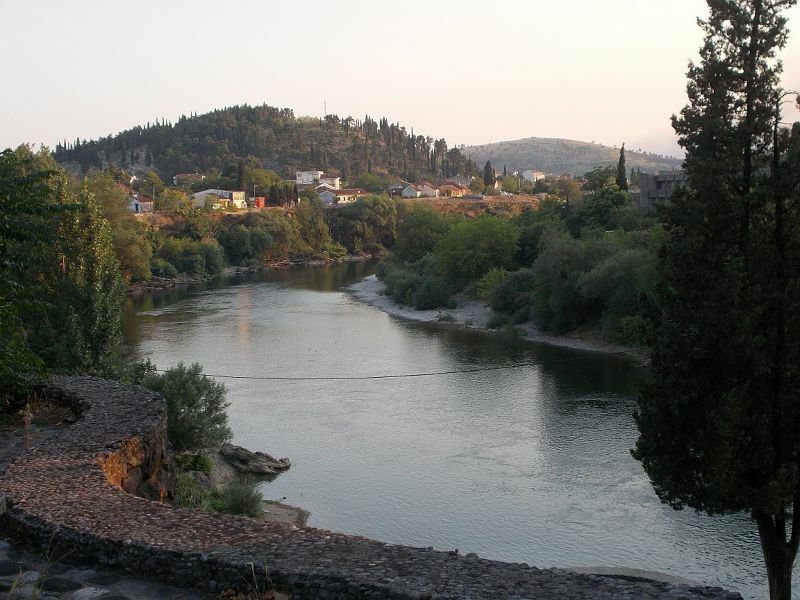 Podgorica is located at the confluence of two rivers: the Moraca and the much smaller Ribnica River. 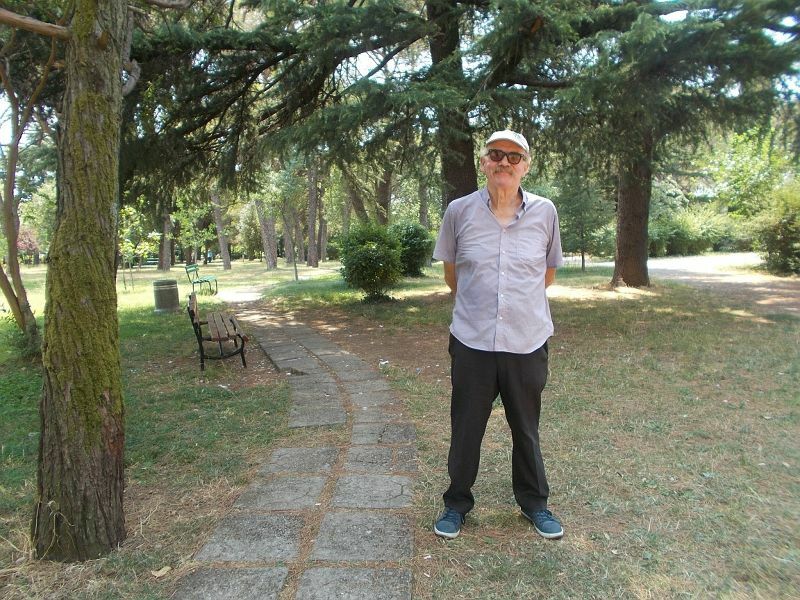 Podgorica gets a very bad press. Before going there, I could scarcely find anyone with a positive thing to say about it. I think this is because is not at all like a European capital city. In fact I would go as far as to say it is not at all like a city. If you change your mindset and start thinking of it as a medium sized town, you will be happier with it. 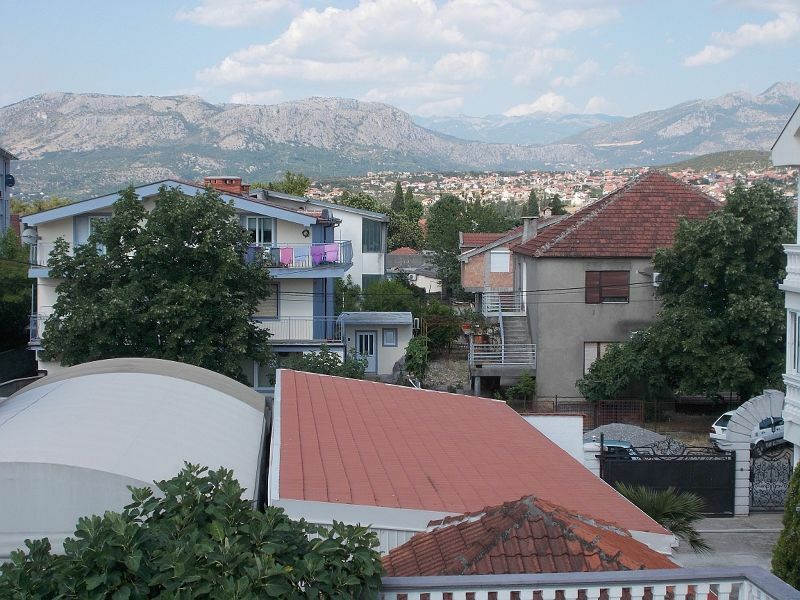 Actually on the whole we liked Podgorica. 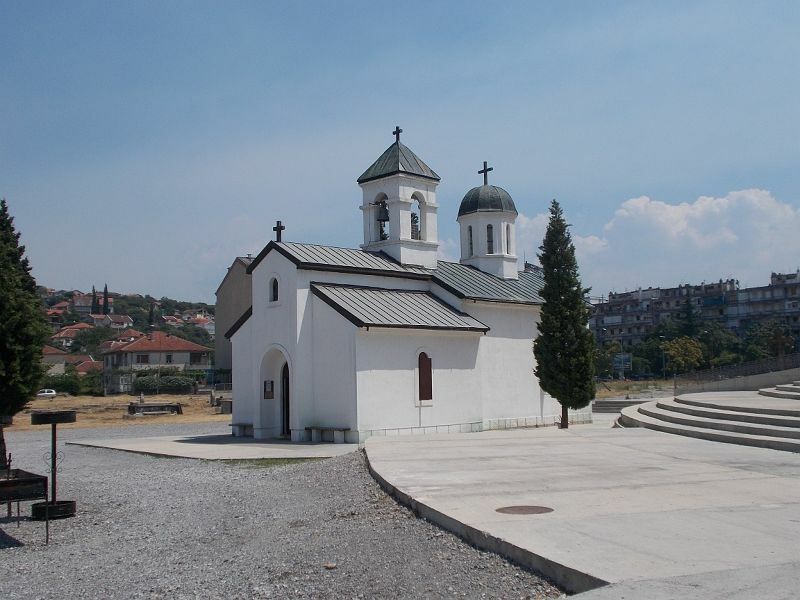 It had only a small number of sights and some of these were scarcely worth seeing, but others were really very good, especially the area around the Moraca River and the stunning new orthodox church. In the new town area there were lots of nice restaurants and bars. It was a fairly relaxed sort of place. The main downside of it was simply that it was way too hot when we visited. We stayed in the Ideal Hotel for three nights. We got there by taking a taxi from the airport. It cost 15 Euros despite the fact the airport information office told us it should have been cheaper. The airport taxi drivers were very aggressive and unpleasant people. Check in was fine. Our room was on the second floor. There is no lift, so we had to carry our luggage upstairs ourselves. Our room, and indeed the whole hotel, was very, very clean. Our bed was comfortable. The air-con in the room worked very well. Thank goodness because it was incredibly hot outside. The hotel provided free wifi and the signal was consistently strong. Some of the fixtures and fittings in our room had seen better days and could have done with replacing, for example the shower door. 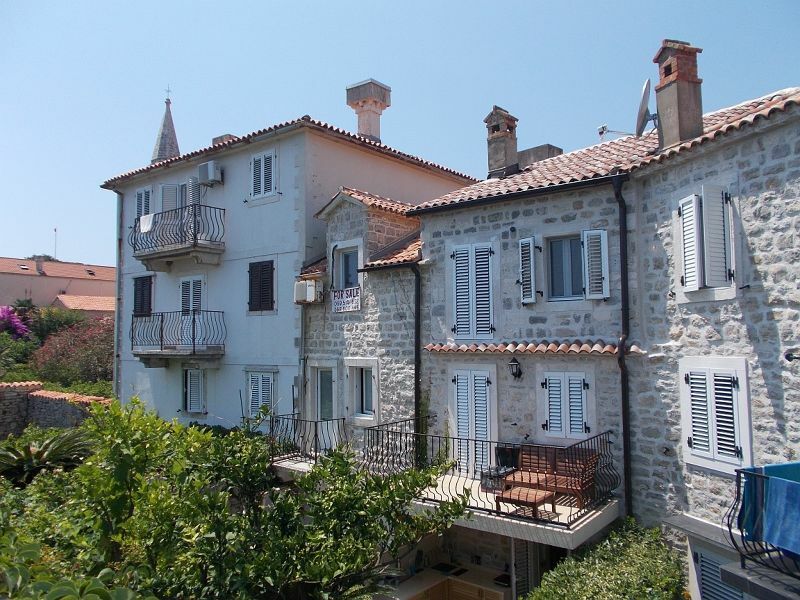 Our room had a pleasant little balcony overlooking some houses and gardens. 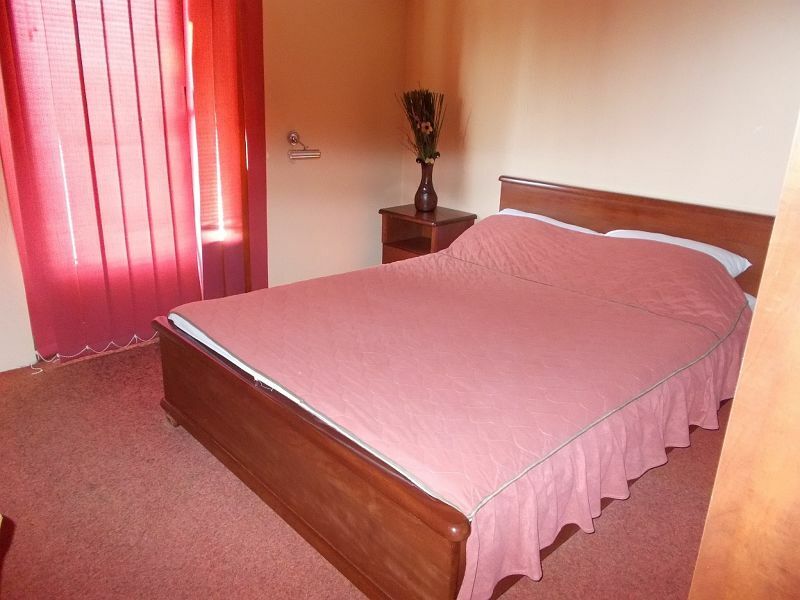 The hotel is in a quiet and peaceful location. The room had no fridge, no safe and no tea/coffee making facilities. Breakfast was included in the room price. It was served downstairs in a room near reception, or you could eat it in the hotel garden if you wanted. Everything at breakfast was made to order. I had cheese omelette every day. There was also cold breakfast, sweet breakfast and other omelettes. The Hotel Ideal did the best coffee I have ever had. It was excellent. The hotel also served dinner in the hotel garden. The menu looked quite good, but we did not eat there. Ideal Hotel is close to a supermarket, an atm and some cafes and bars. 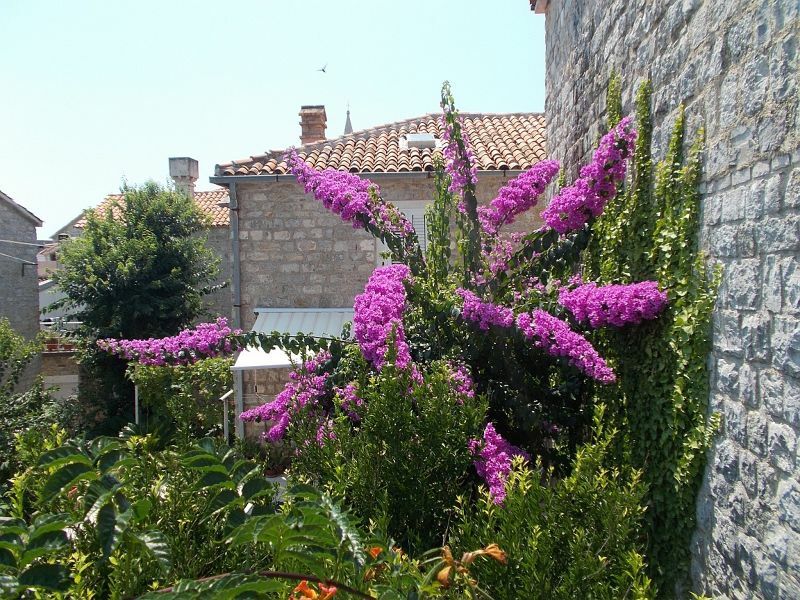 To get to the centre of Podgorica was about 20 minutes walk on an easy direct route. It was quite a hot walk in summer, but we managed it. Taxis are available near to the hotel. 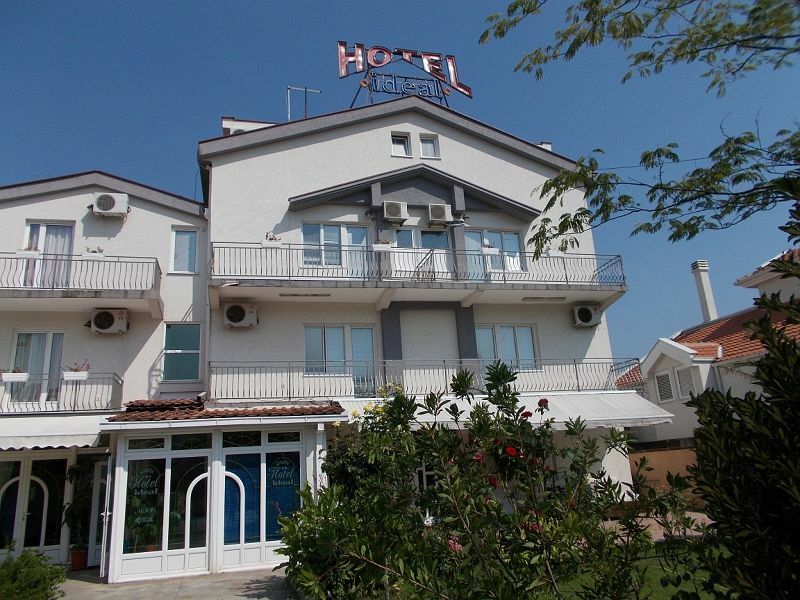 The hotel is about 15 minutes walk from Podgorica's bus and train station. Check out from the hotel was fine. Overall we enjoyed our stay in the Ideal Hotel and would stay there again. Our Sightseeing started off badly with each sight being a bit disappointing but it got better and several sights were very enjoyable indeed. The Roman Catholic Church. 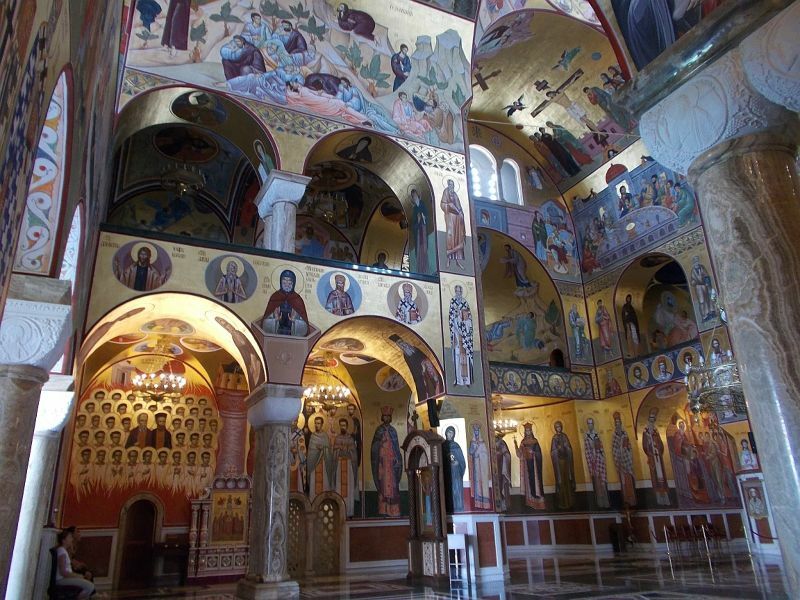 The Church of the Holy Heart of Jesus. This church was the first site we visited because it was between our hotel and the centre of town. It was not open so we did not get to look inside. 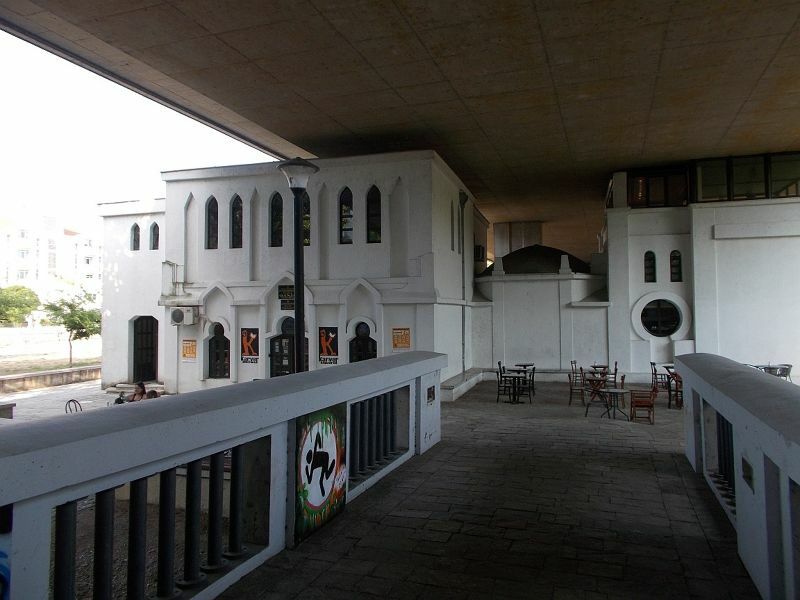 The church is of an unusual modern architectural design. 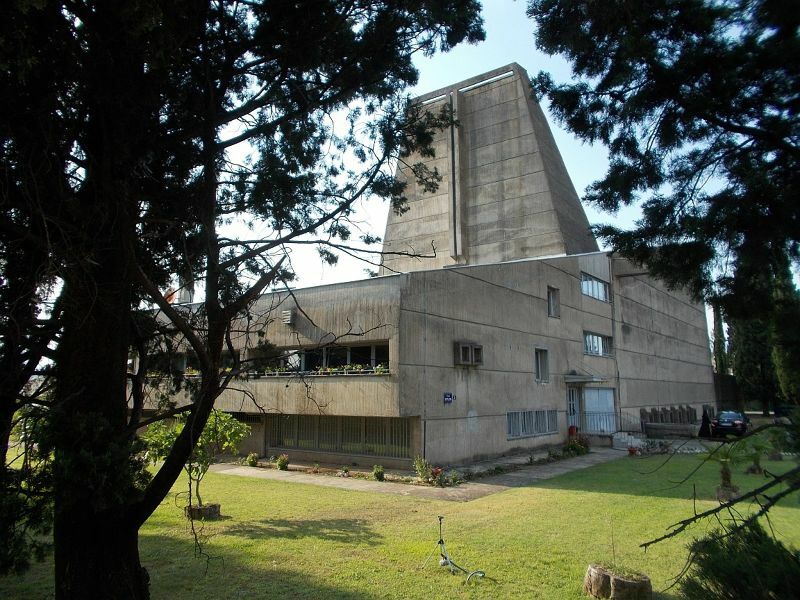 It is made of concrete and dates from 1969. 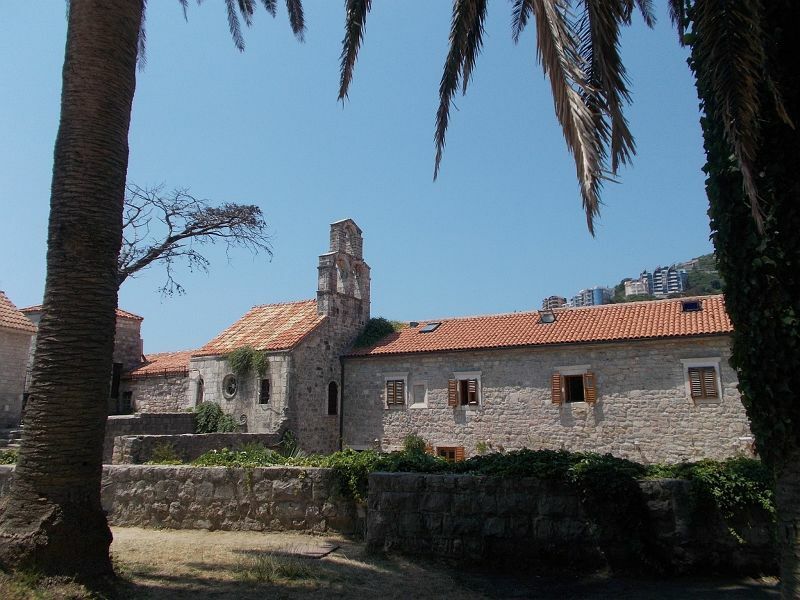 It was built to replace an earlier church which was flattened in World War 11. It's worth a look but not stunning by any means. The church is dedicated to the Sacred Heart of Jesus. It has around 2000 members. The Ottoman Bathhouse - Tursko Kupatilo. 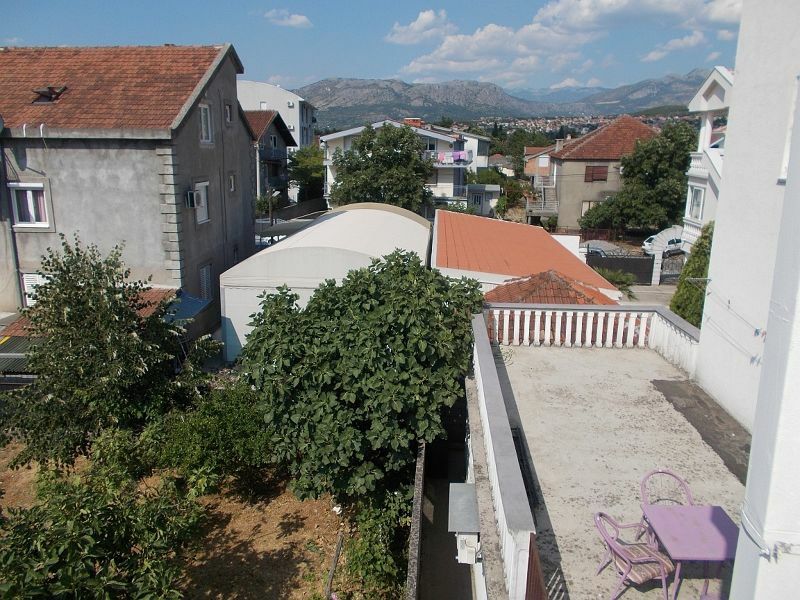 Podgorica does not have too many old buildings as it was largely flattened in World War 11, so you would think the city would value the ones it does have. That was not the case with the Ottoman bathhouse. City planners decided to build a road above it and this necessitated removing its domed roof. 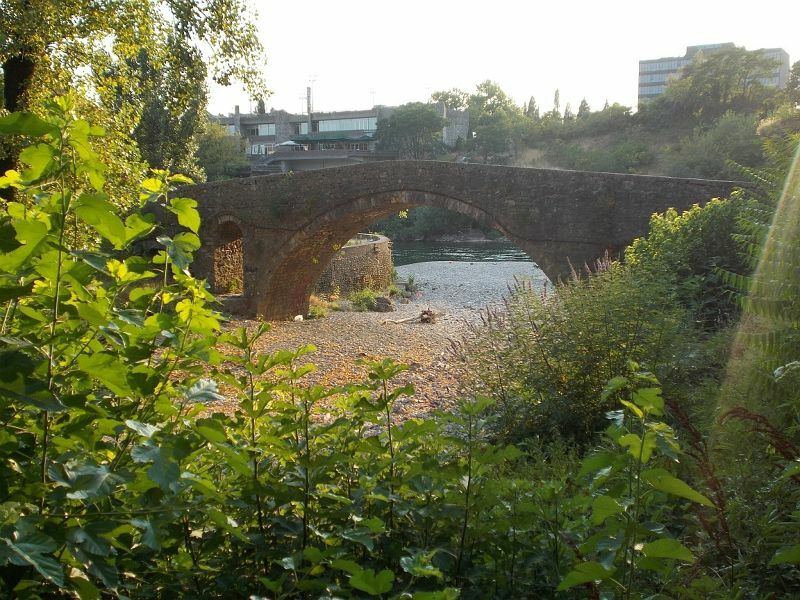 The building sits forlornly under a road bridge, surrounded by graffiti and, on our visit, next to a dried up river. Despite all of this it still manages to be quite an attractive building. 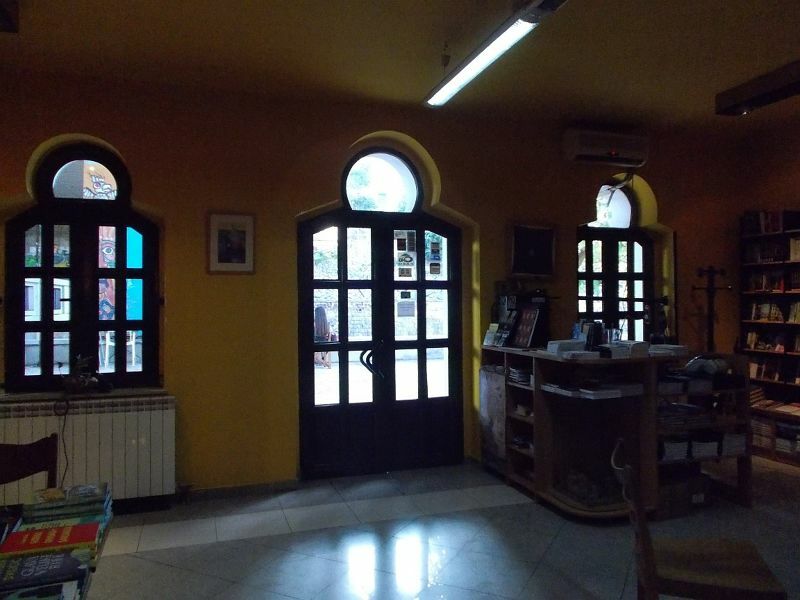 It is currently used as a bookshop and cafe. 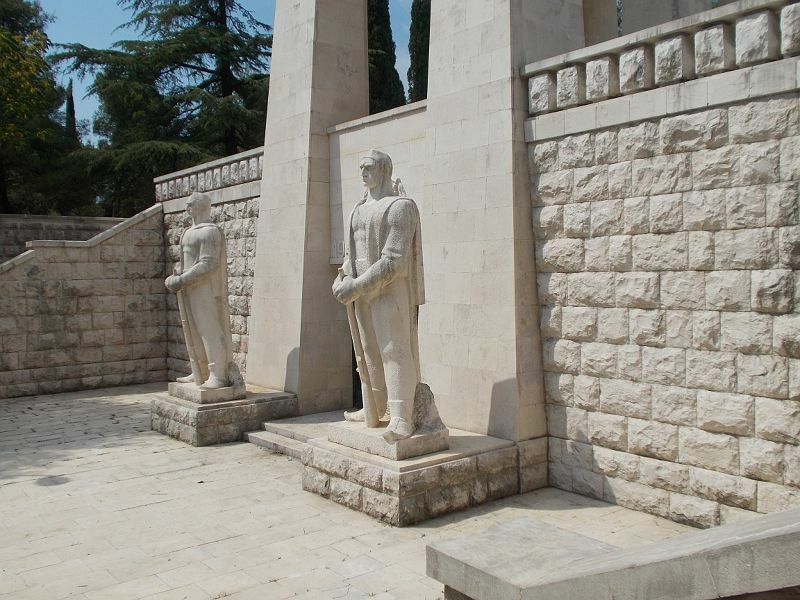 This was the first of Podgorica's sites that I actually really liked. 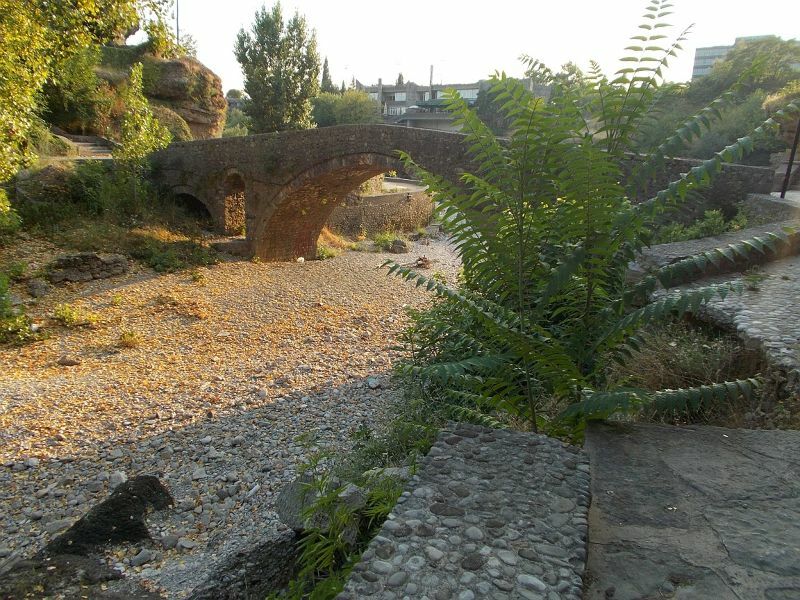 The Ribnica River was not at its best; it was completely dry. The stone bridge across it had the odd graffitti tag. The remains of the fortress are few and far between and the centre of the fortress was filled with large rubbish bins. Despite all of this, this sight is worth seeing. 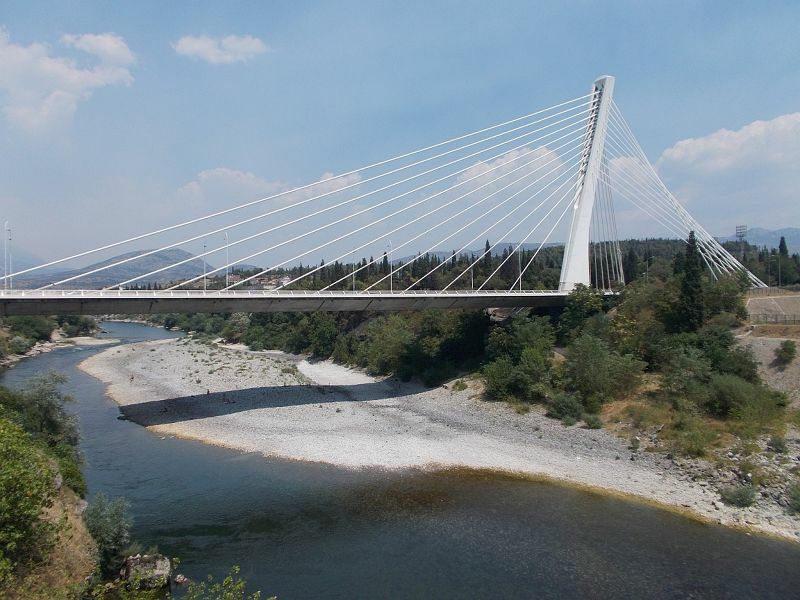 The Ribnica Bridge crosses the Ribnica River just before it flows into the much larger Moraca River. 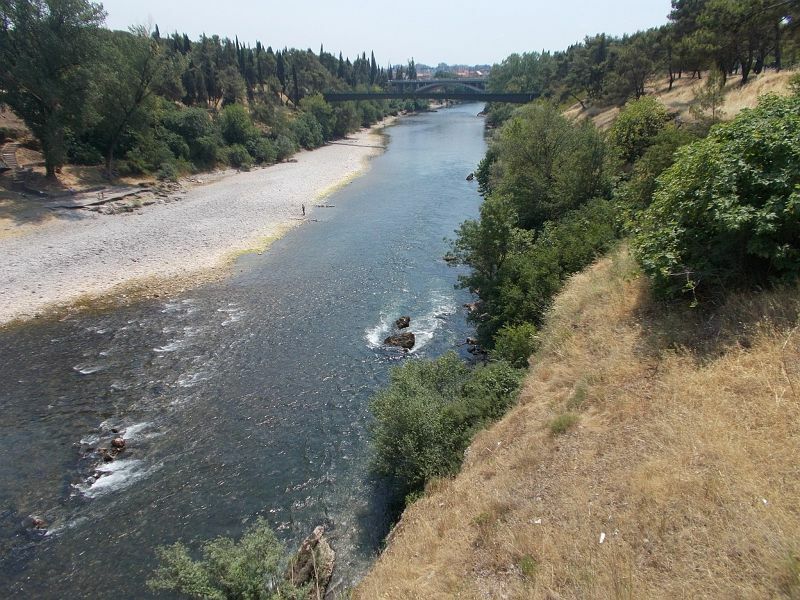 People were wading in the river or lounging around its edges in their swim wear. There was a very pleasant atmosphere here and this felt like a much loved and favourite spot of the locals. The atmosphere rubbed off and made the area very pleasant. 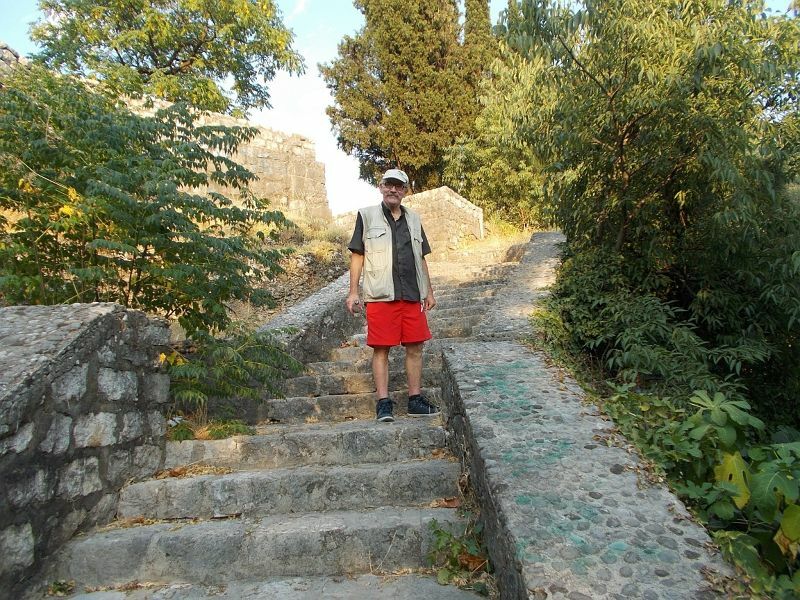 Climbing up to the fortress or up to the bridge over the Moraca River presented us with wonderful views. 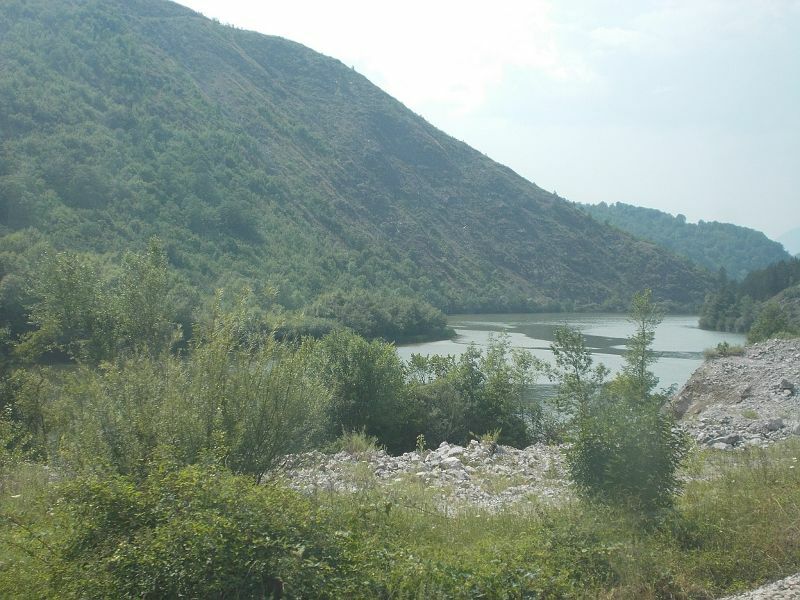 The Moraca River is in a deep ravine. It is crossed by many bridges and it is quite stunning. 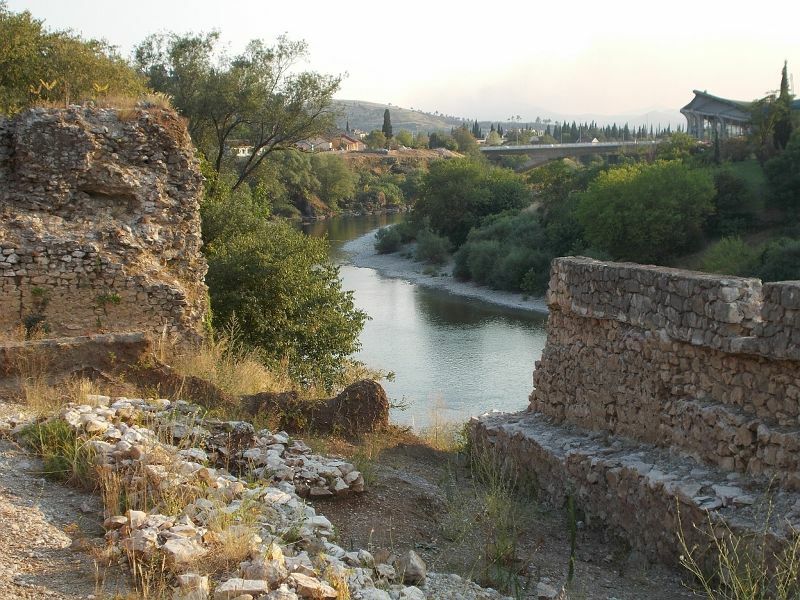 The Ribnica Bridge was built by the Ottomans in the fifteenth century. 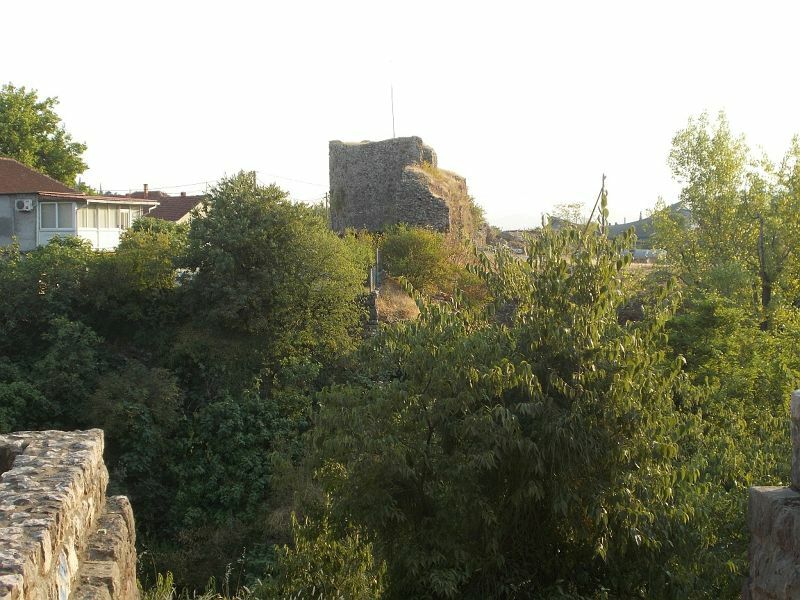 The Ribnica Fortress was also built by the Ottomans in 1474. It was once a massive castle; now only a few walls remain. 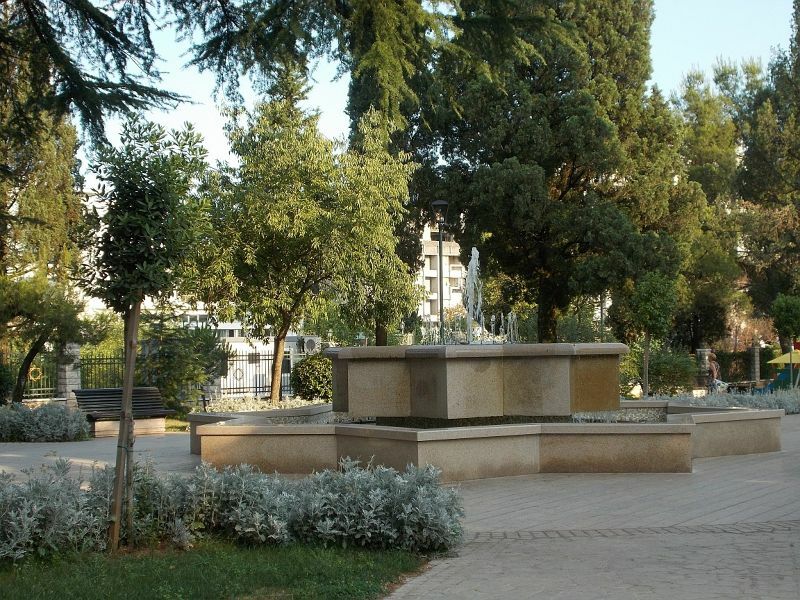 Podgorica has several parks. They tend to join together or be near each other, so I did not really think of them as separate places. None of them were spectacular. All of them were pleasant. They provide seating and shade from the relentless sun. All of them had lots of grass and trees. Some had flowers, statues and fountains. 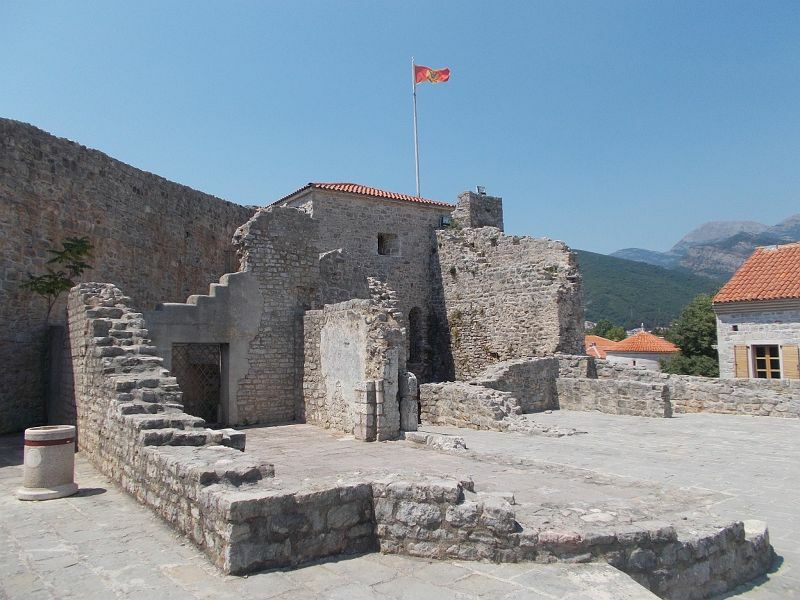 King Nikola was the last king of Montenegro. He lived from 1841 to 1921. He was a general, a politician and a poet. 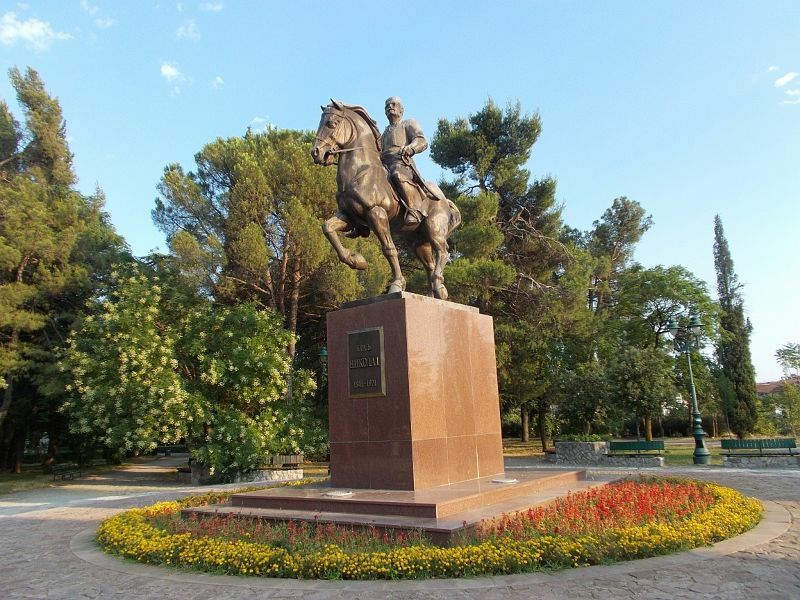 The statue shows him seated on a horse. 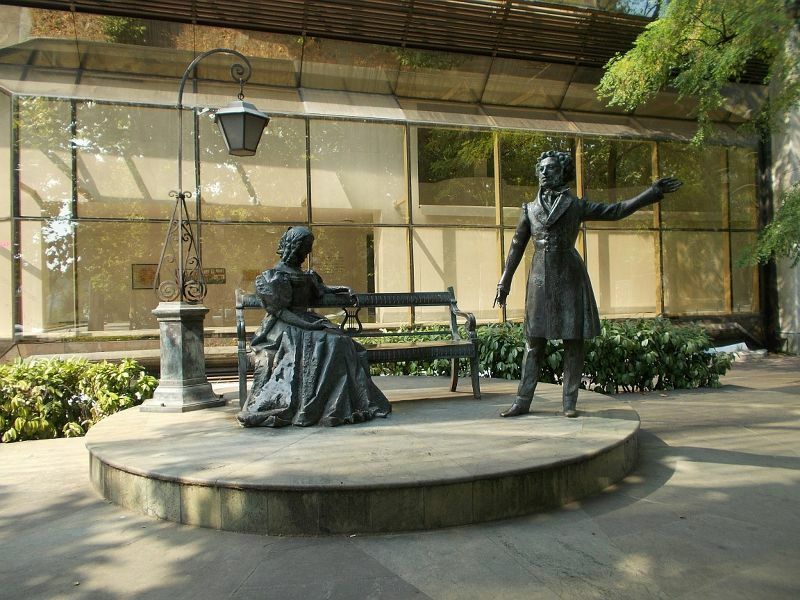 It was sculpted by Risto Radmilovic and was unveiled in 2005. 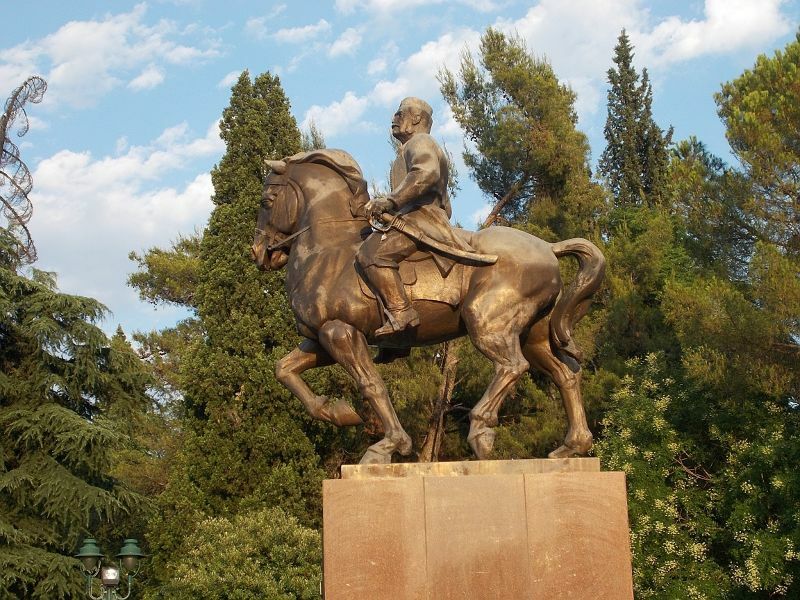 Fortunately we saw it before we visited Skopje - a city guaranteed to destroy your interest in statues of men on horses. The Clock Tower - Sahat Kula. 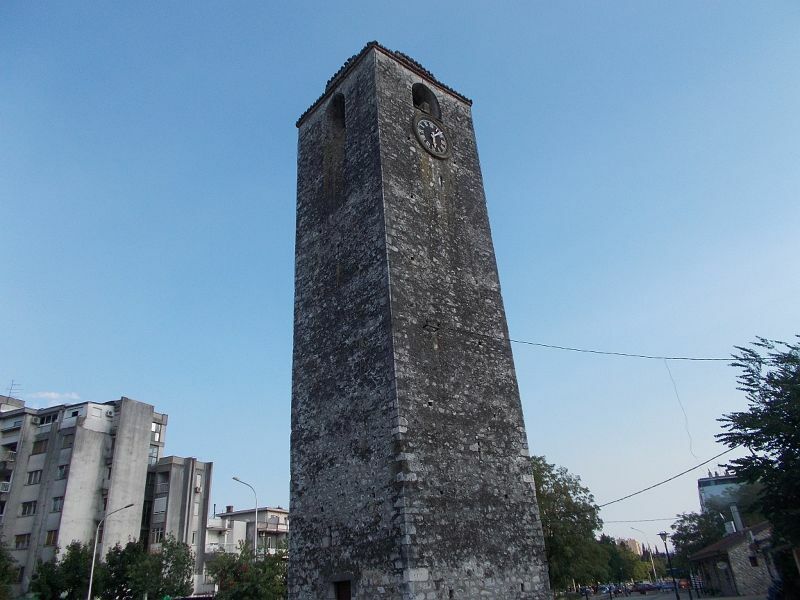 The Clock Tower is one of Podgorica's few remaining historical buildings. It is set in an open square. It is worth a look, but is not overly impressive. It dates from Ottoman times and served to remind people of the five daily calls to prayer. There are two little mosques nearby it. 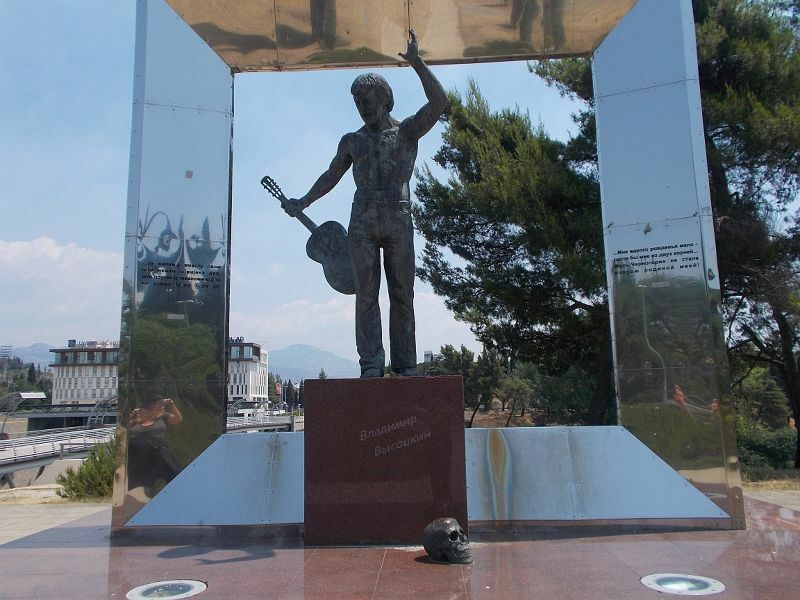 When we visited Podgorica we liked this statue. I especially like statues you can join in with and this one is a perfect example with its extra chair between the main figures. At the time of our visit we had no idea what this statue was. We were unable to read the information next to it which was in Cyrillic. 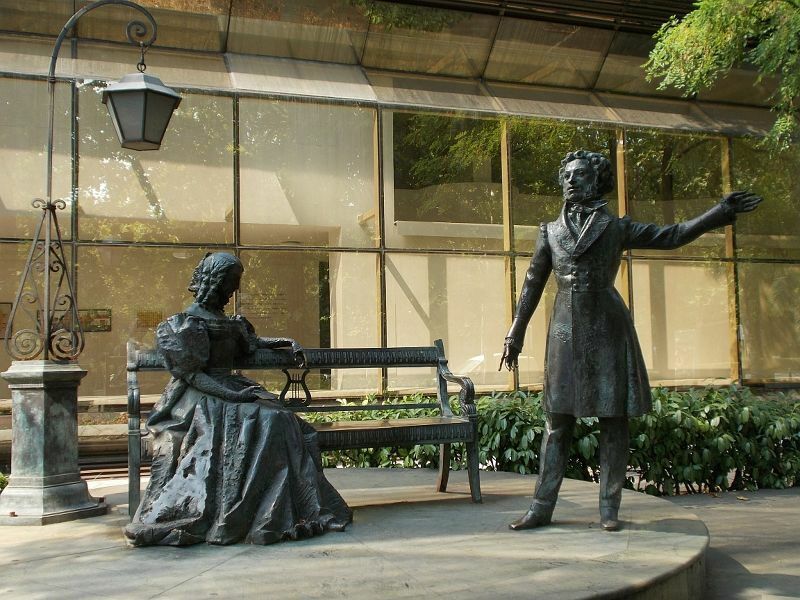 We have since discovered it was a monument to Alexander Pushkin, the great Russian poet. 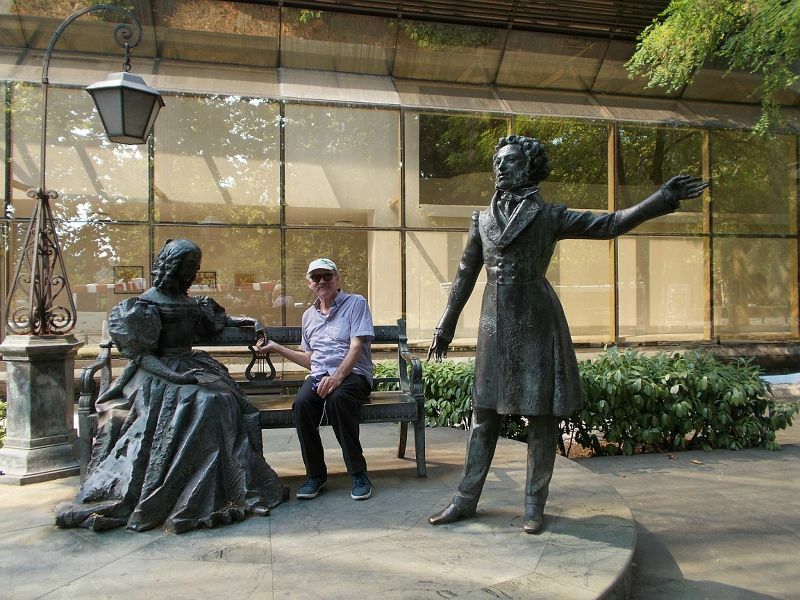 The seated lady is his wife. 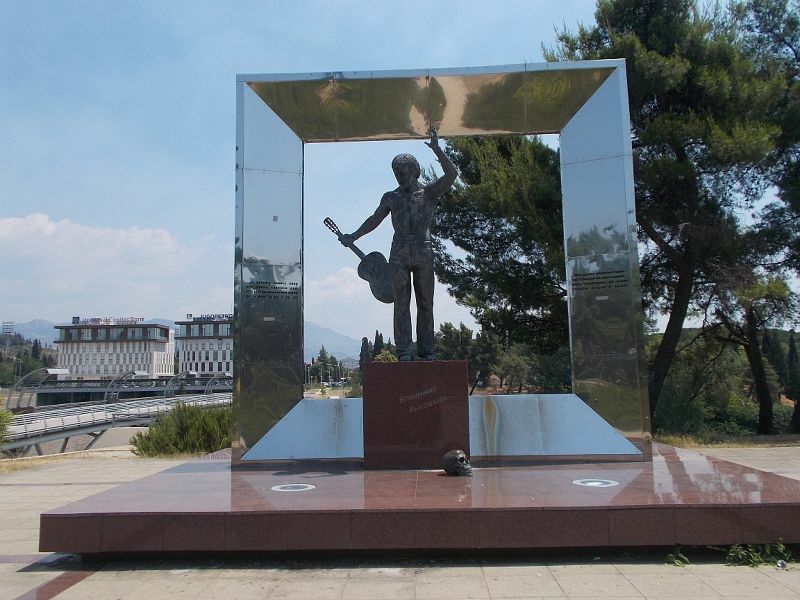 The statue was a gift from the city of Moscow to Podgorica. 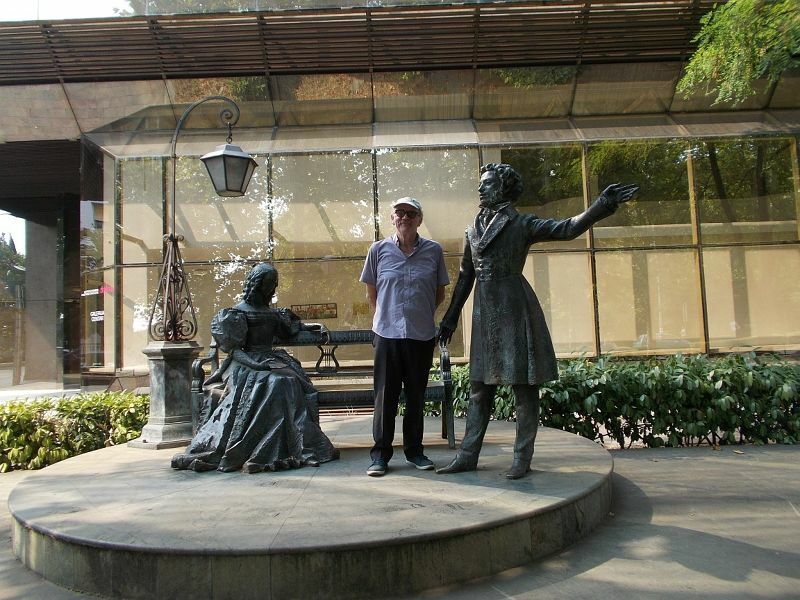 The inscription on the statue is a line from a Pushkin poem about Montenegro. 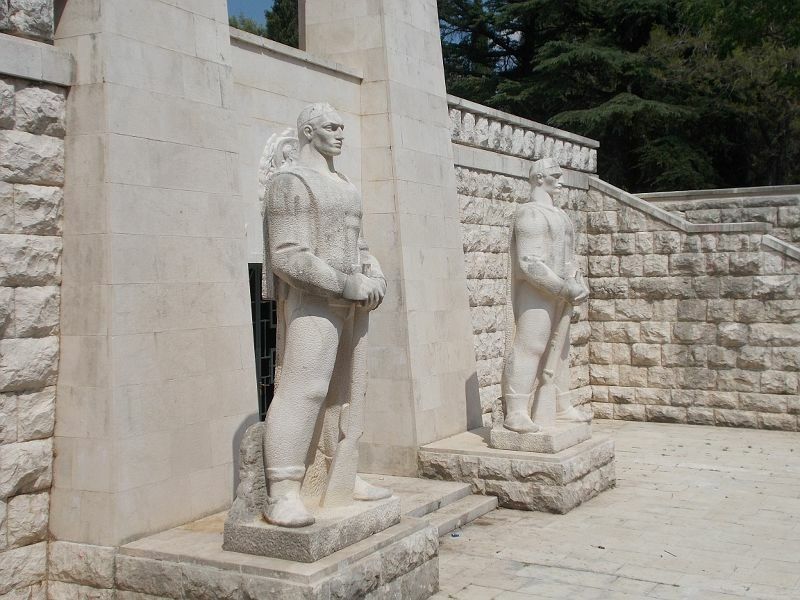 It says "Who are these Montenegrins and why they are so tough and dangerous?" 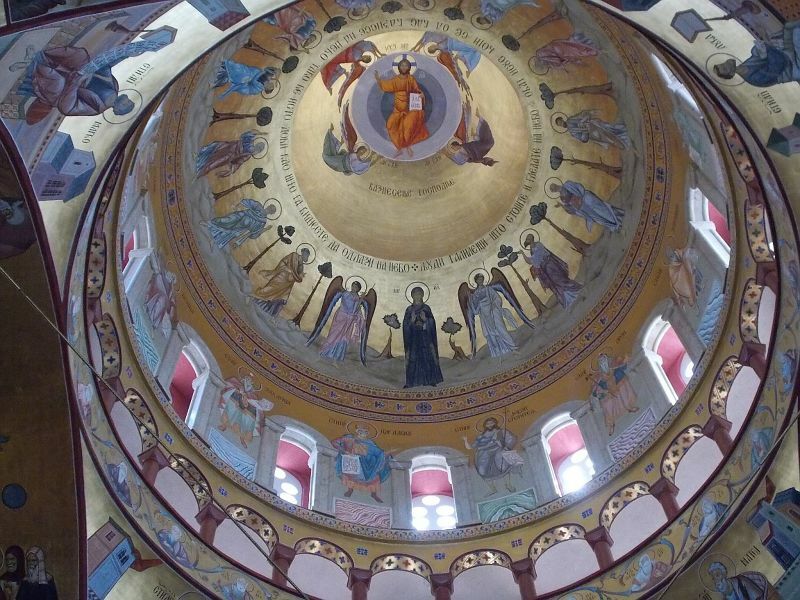 The Cathedral of the Resurrection of Christ. 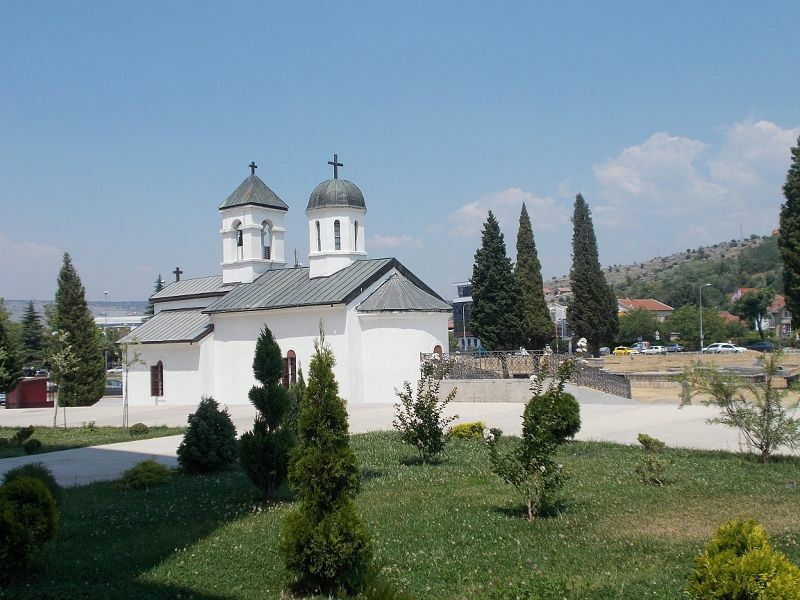 The Cathedral of the Resurrection of Christ is also known as Saborni Hram Hristovog Vaskrsenja. Due to the intense heat we took a taxi to this church then slowly wended our way back via several sights. This cathedral is stunning. 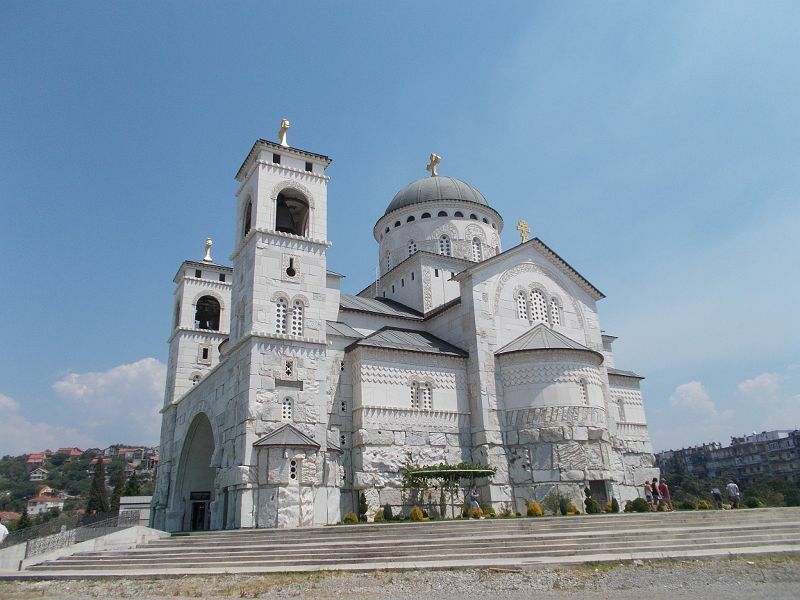 It is one of the most beautiful churches I have ever seen and unlike many others in the former Yugoslavia, no-one seemed to mind if you took photos. The church is surprisingly very modern. Construction of it began in 1993 and it was completed in 2013. The church has two towers and a large dome. 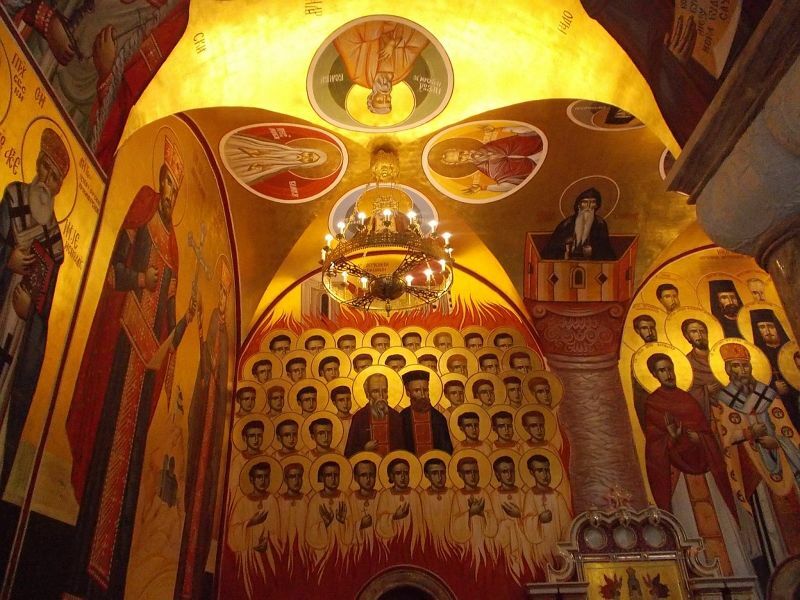 The inside of the church is covered everywhere with the most beautiful paintings. Next to the cathedral there is a small chapel and a large graveyard. 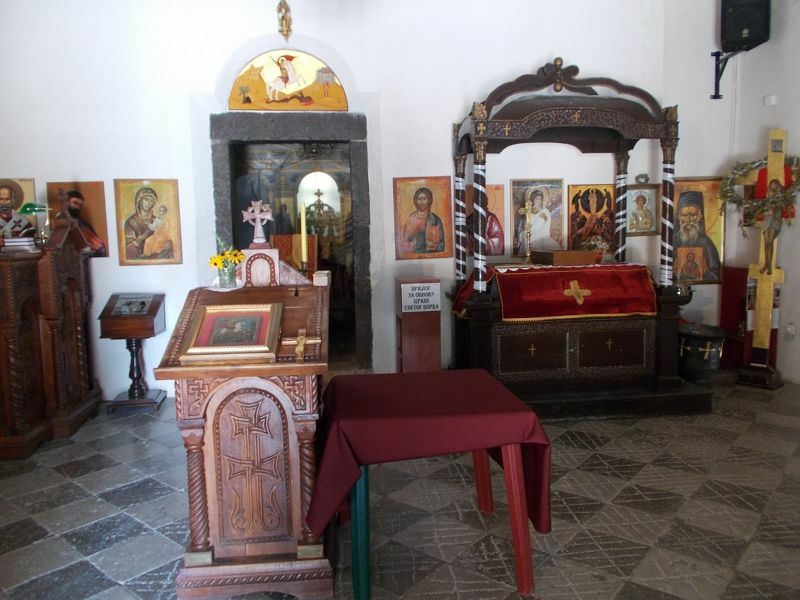 I would strongly recommend a visit to this church if you are ever in Podgorica. Small Church Next to Cathedral. There was a small church next to the cathedral. When we arrived it was open, but it closed before we could visit. This was not a problem as you could look through the windows to see the lovely interior. Behind the church there was quite a large graveyard. The Millenium Bridge - Most Milenijum. 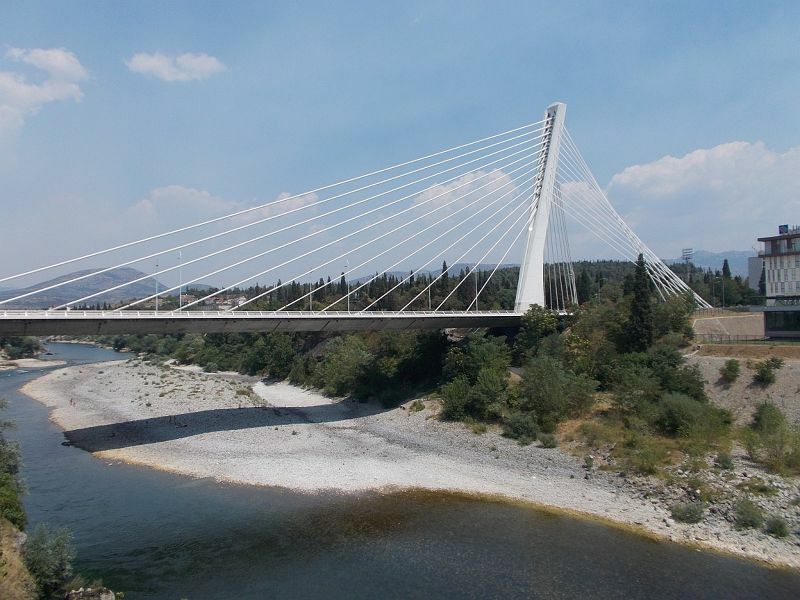 Completed in 2005 this beautiful 140 metre long cable-stayed bridge has become the new symbol of Podgorica. We viewed it from the nearby Moskovski Pedestrian Bridge. It is a very impressive structure with its 57 metre high pylon supporting 36 cables. 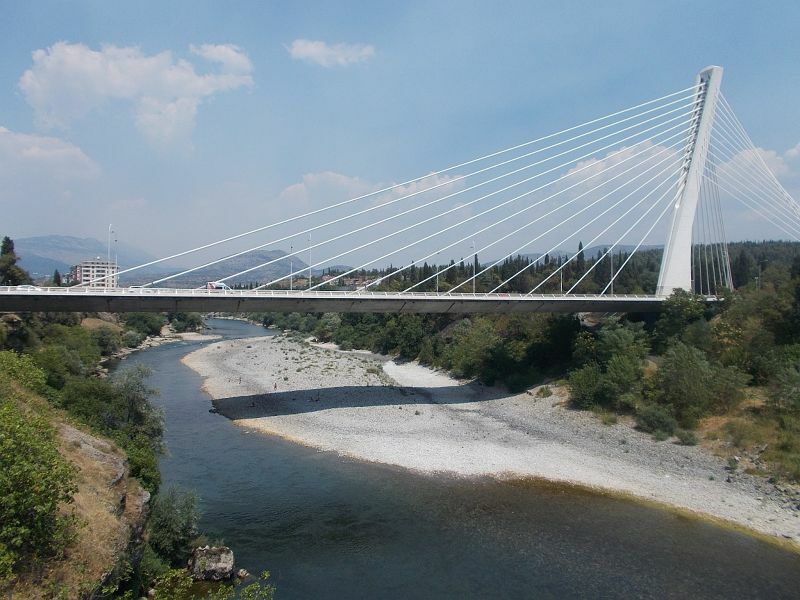 The bridge crosses the stunning Moraca River. Well worth seeing. 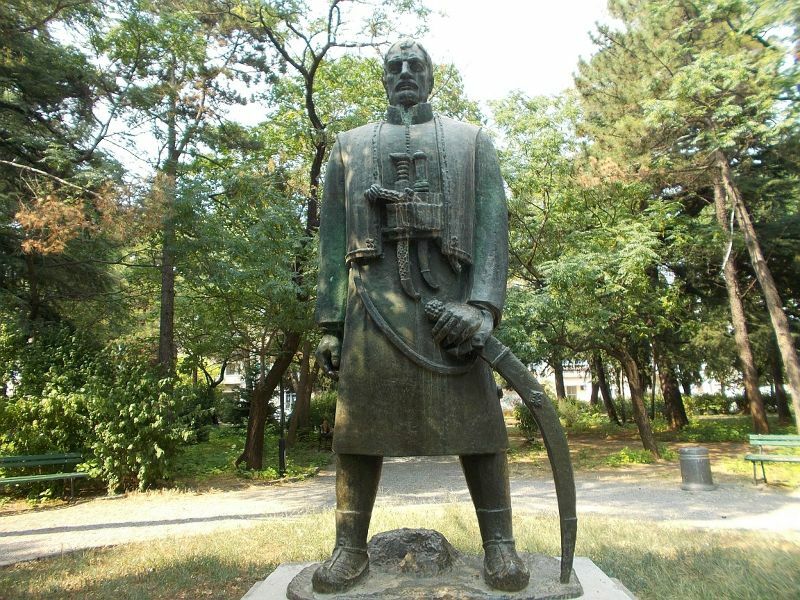 Monument to Petar 11 - Petrovic Njegos. 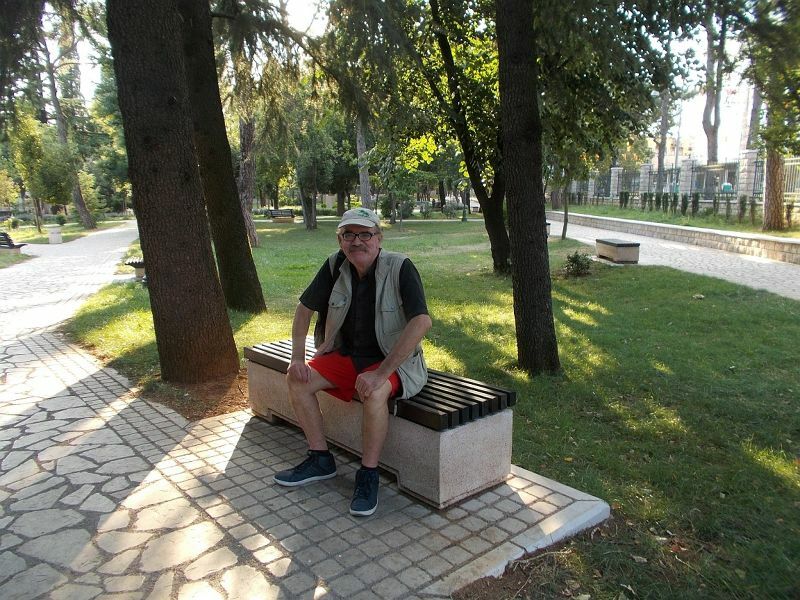 This is located in a little park near the Moraca River. 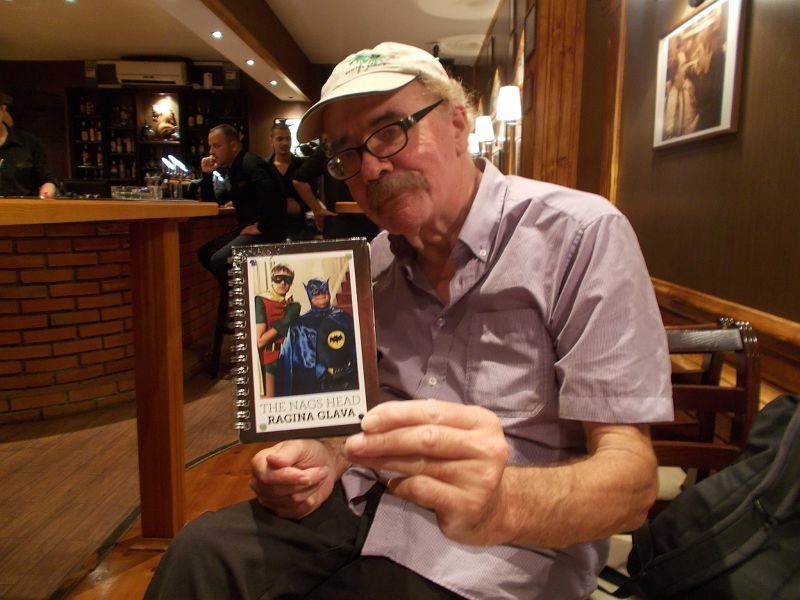 Petar 11 Petrovic Njegos is seated and has a book. He was a bishop, writer and philosopher. 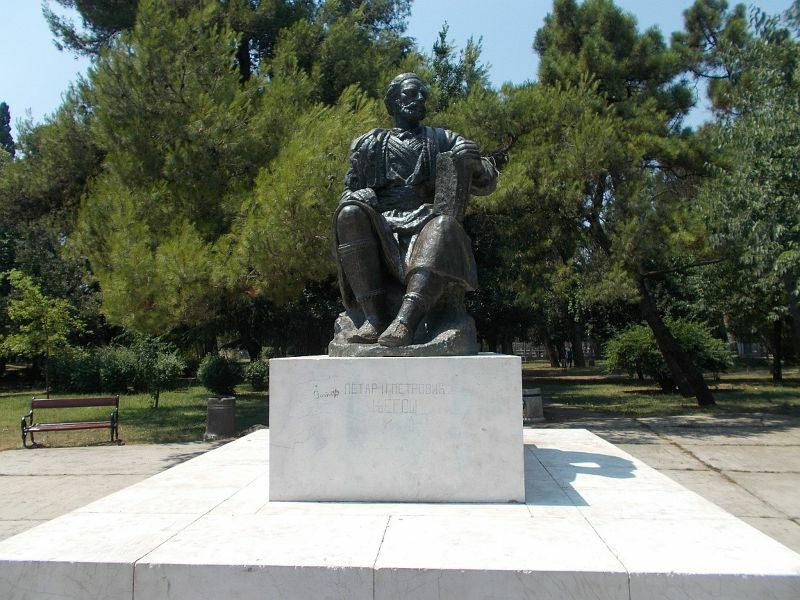 The statue was created by Sreten Stojanovic in 1954. 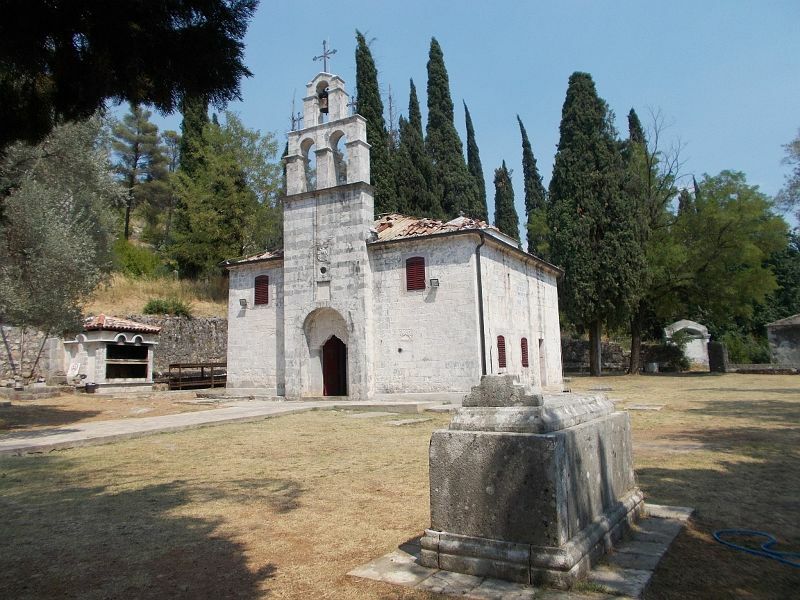 St George's Church is located at the foot of Gorica Hill. 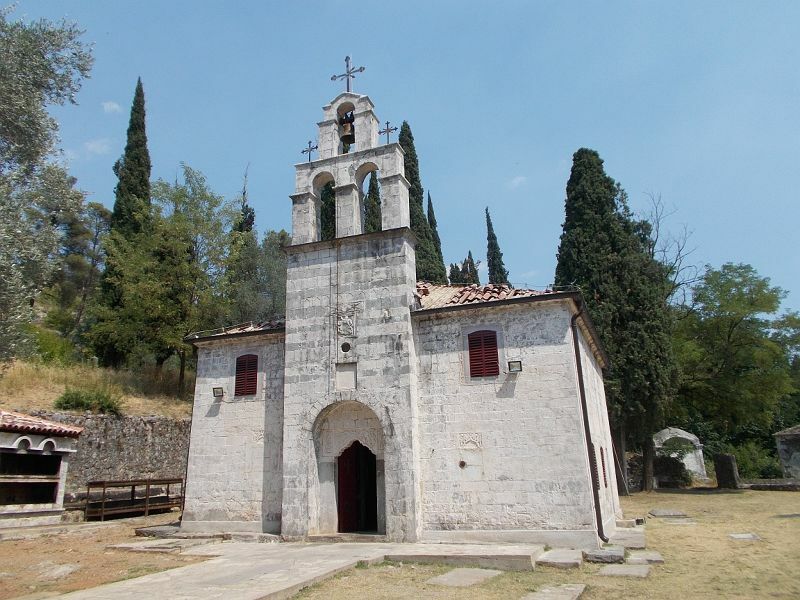 It is the oldest church in Podgorica. 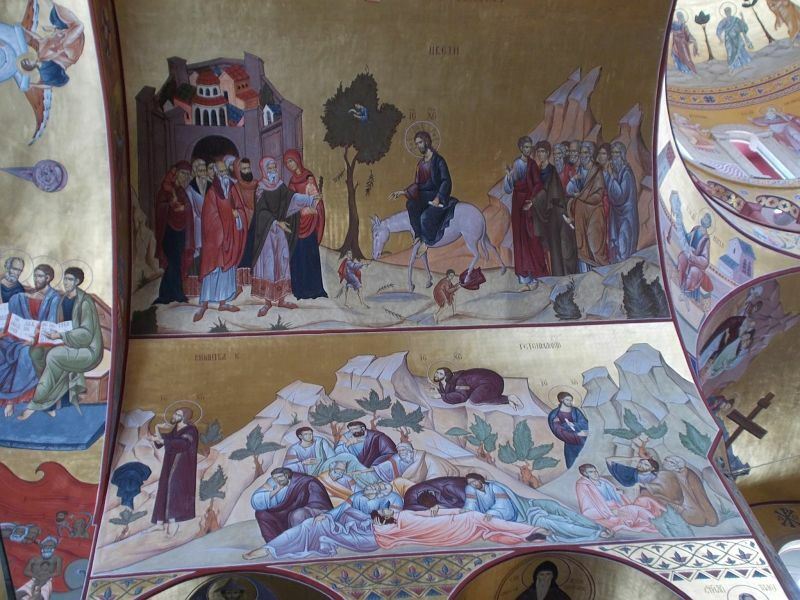 There is an icon inside depicting George and the dragon. It is a lovely little church dating from the sixteenth century. Outside it is surrounded by a little graveyard. 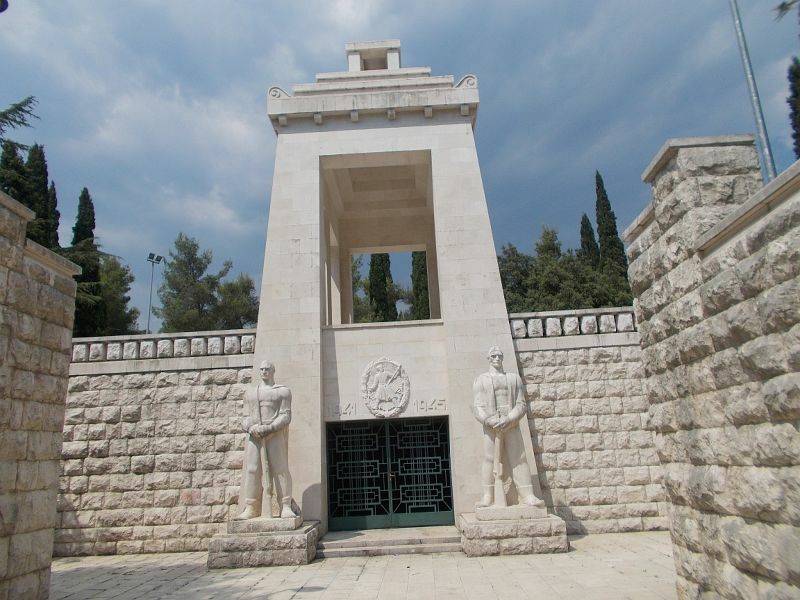 I walked up Gorica Hill from Saint George's Church to the Partizan Memorial. This monument was quite impressive. 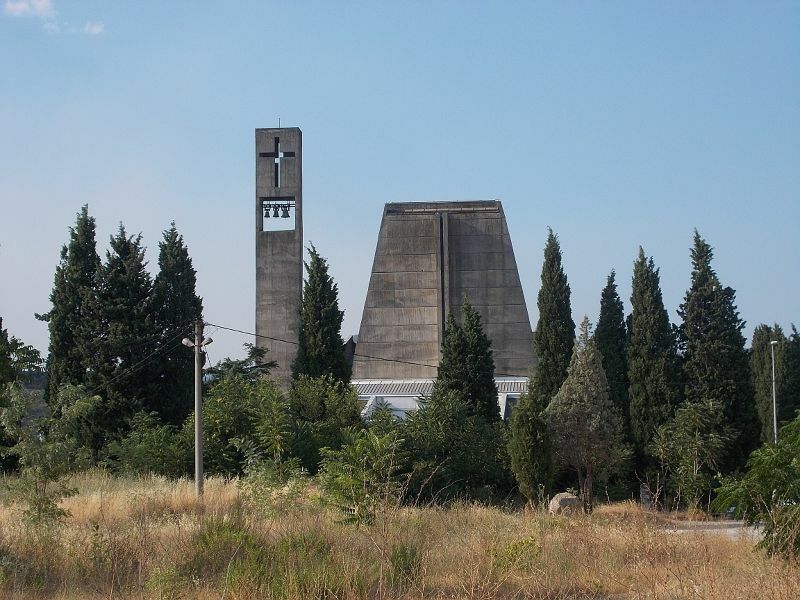 It was built in 1953 by architect Vojislav Dokic and covers the remains of Partizan fighters. The text on the monument says " They loved freedom more than life. 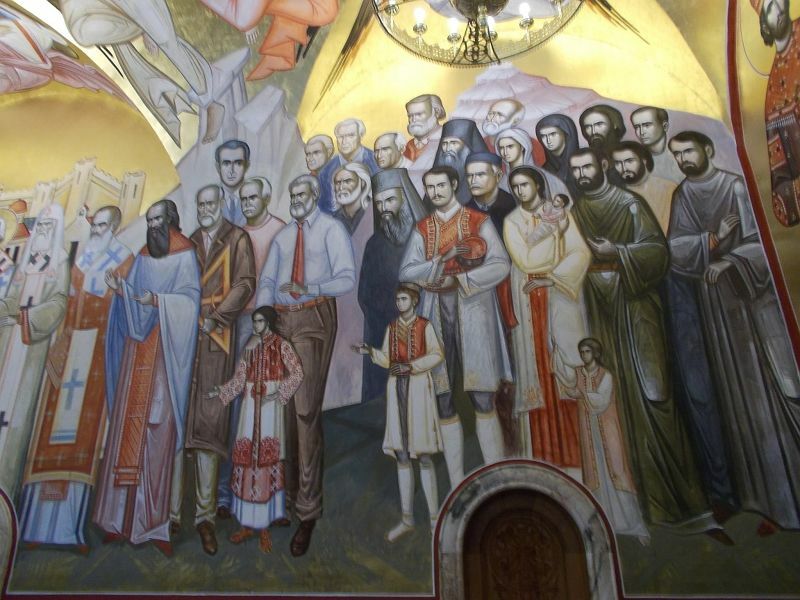 In the war of national liberation from 1941 to 1945, 6780 fighters from Montenegro fell and 7479 sons and daughters of Montenegrin people were killed by fascist occupiers and domestic traitors." 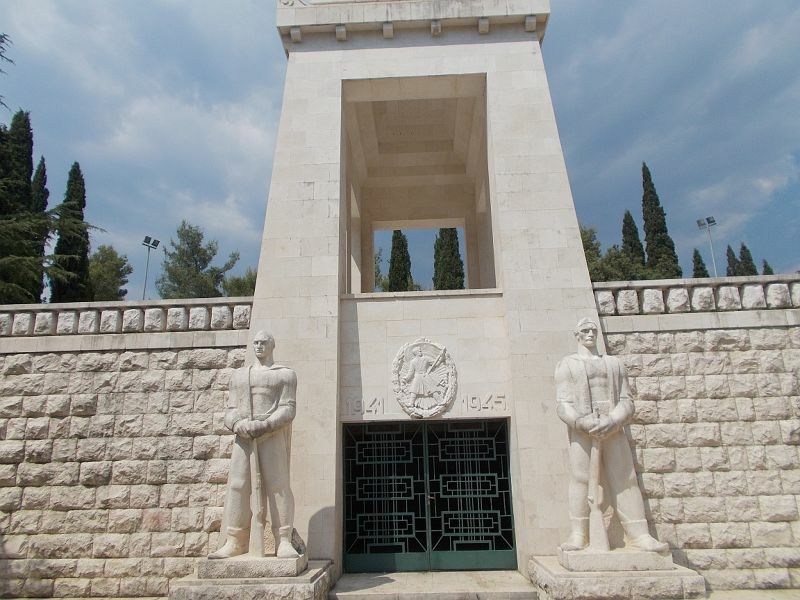 The monument is guarded by two large statues. 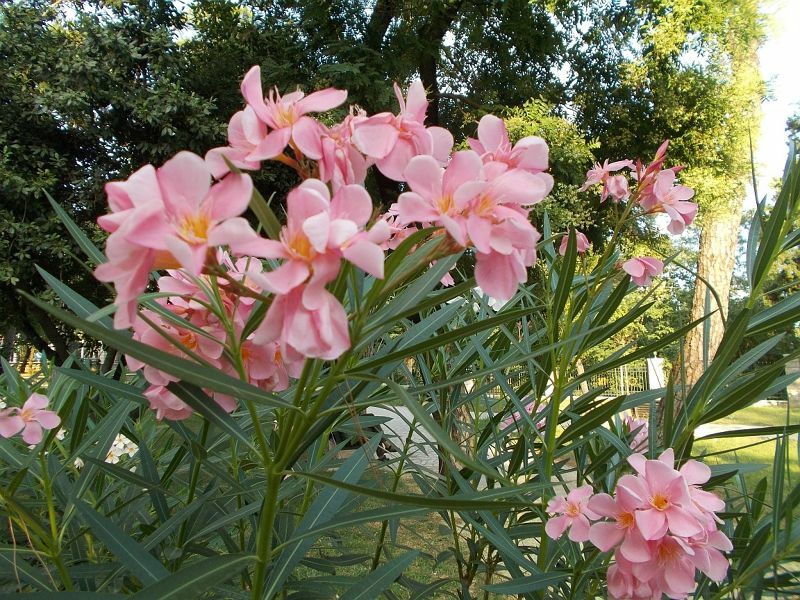 The monument is a short easy walk from Saint George's Church and is well worth a visit. 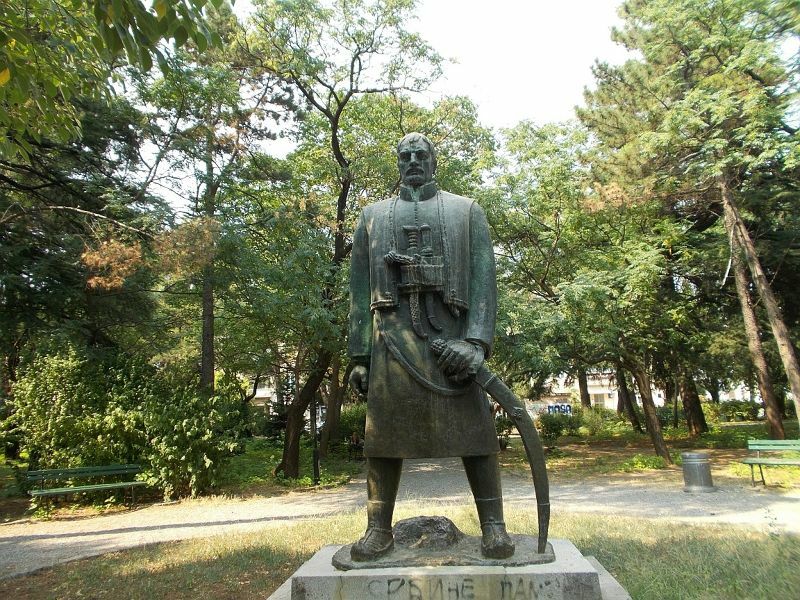 This statue depicts Karadorde Petrovic a famous general and politician. He lived from 1768 to 1817. The monument is made of bronze and is 3.5 metres high. 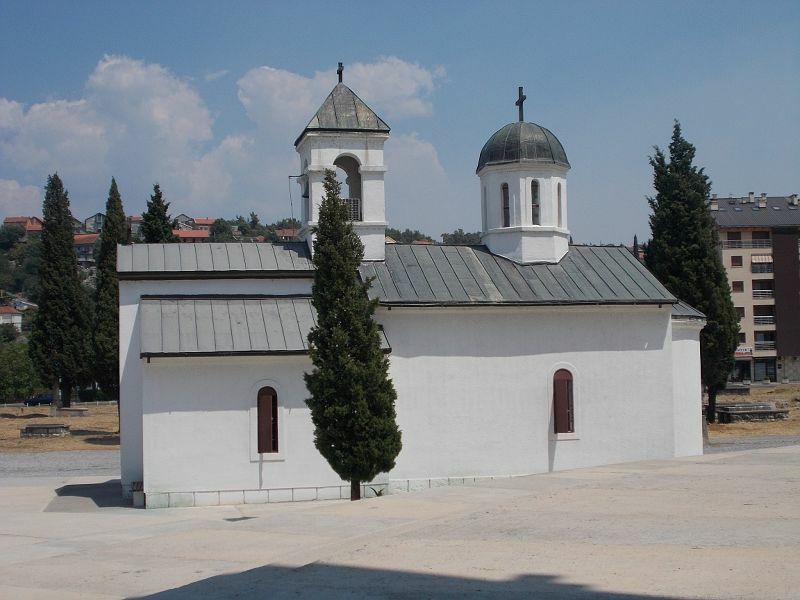 It was built by Sreten Stojanovic. Karadorde Petrovic was the leader of the First Serbian uprising against the Ottomans in 1804. 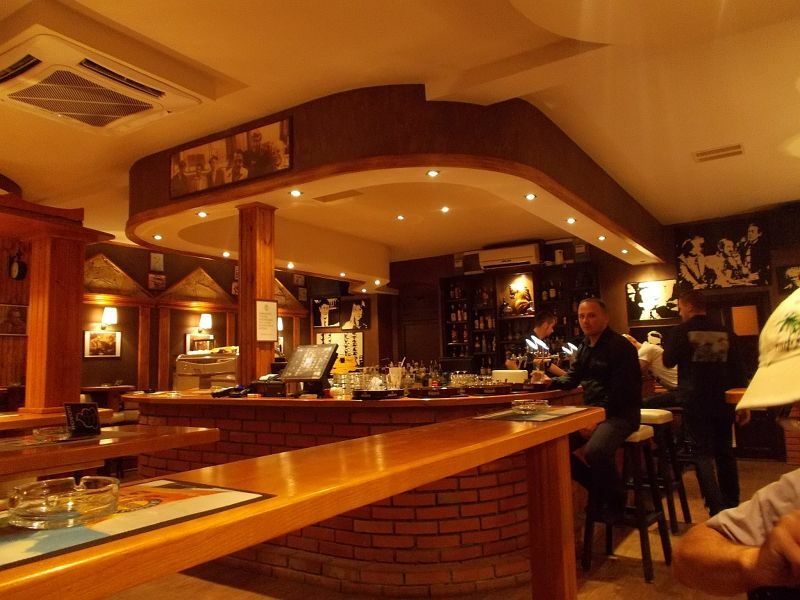 Podgorica has some good restaurants and interesting pubs to visit. The Nag's Head: Entertaining Bar. This was an interesting pub. 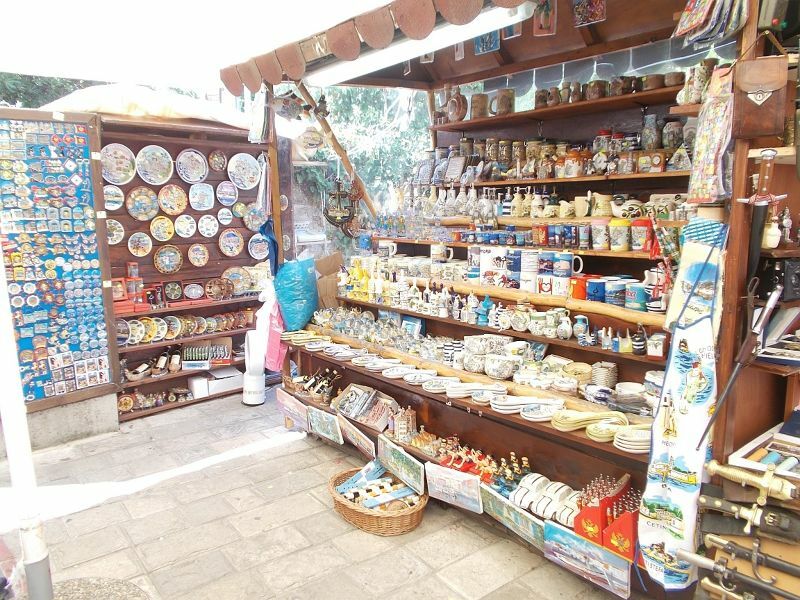 The owner is a big fan of the British TV comedy 'Only Fools and Horses'. He based his pub on the pub in this TV show. 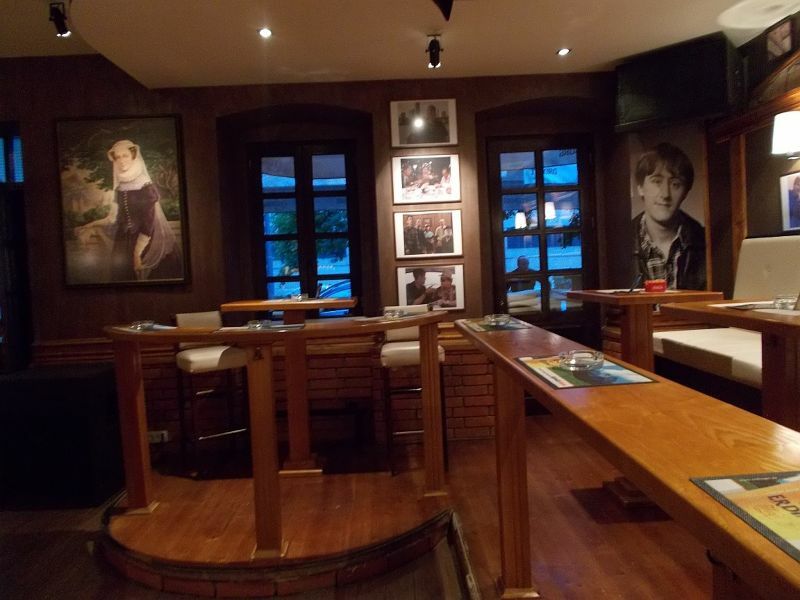 The menu depicts scenes from the show and the walls are covered with pictures of the characters from the TV show. Quite an interesting place to visit. Captain Jack's Bar: Pleasant place for a drink. 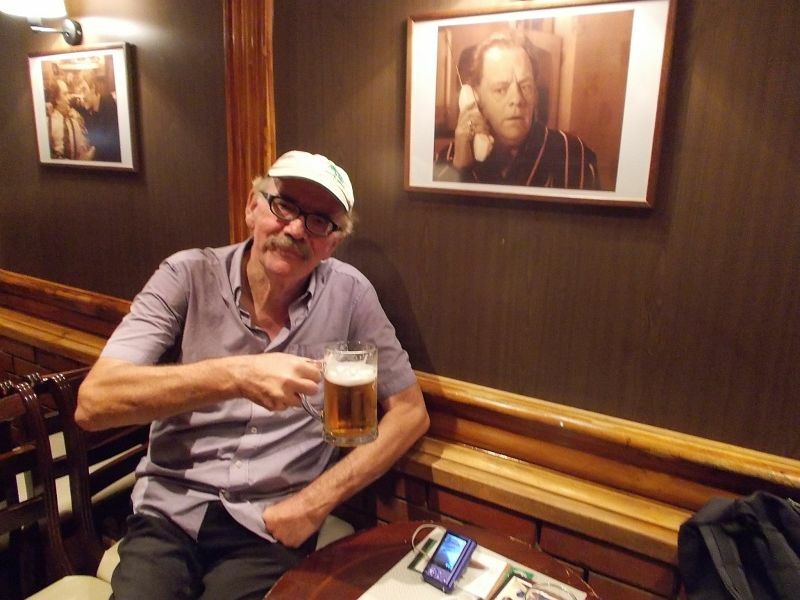 We stopped in this very pleasant new town bar to cool down and have a refreshing drink. The girl who served us was very pleasant and friendly. The bar is themed on Johnny Depp as Captain Jack in the Pirates of the Caribbean movies. There are pictures of him everywhere. 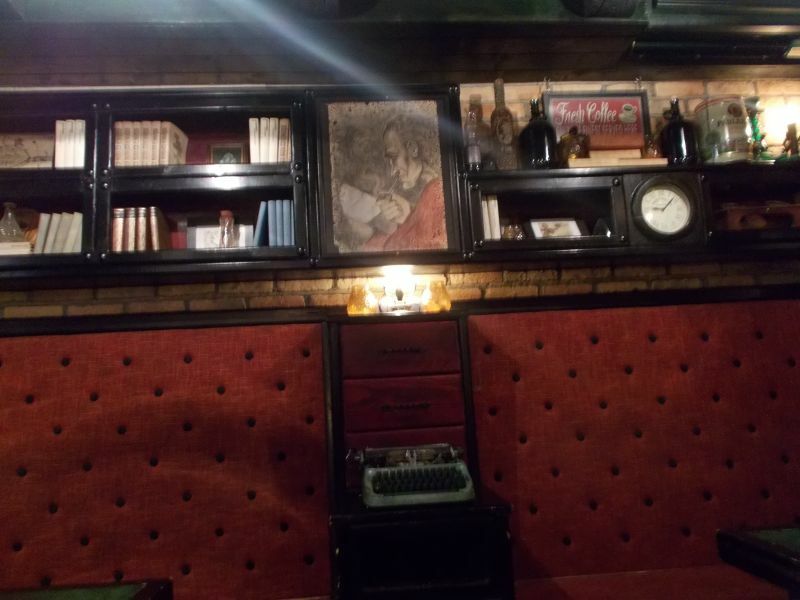 The Sherlock Holmes Pub: Good spot for a beer. This bar was not too far from our hotel. It had an outside seating area which is where we sat. I went inside to use the toilet and liked the way it was decorated with wood panelling, typewriters, rows of old books, paintings of Sherlock Holmes. It was quite interesting. This is just a bar. I don't think it does food. 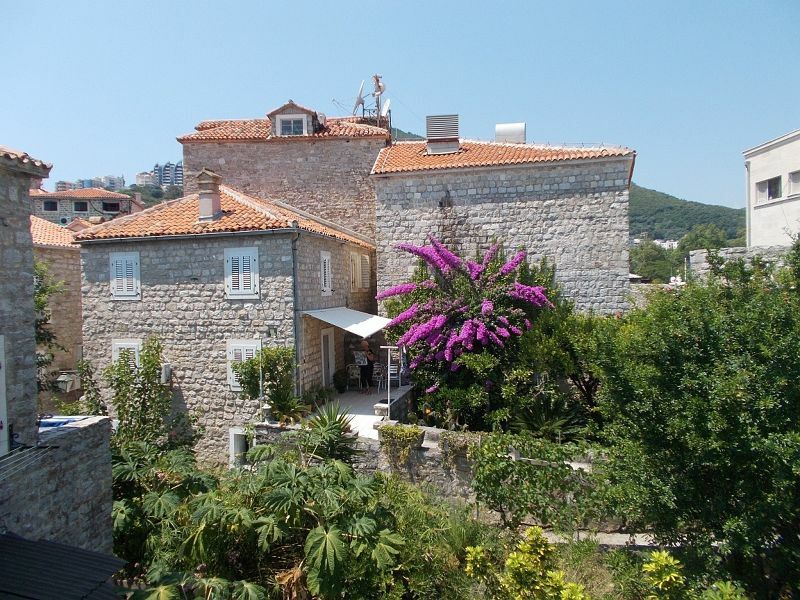 Address: Bulevar Peka Dapčevića 1, Podgorica, 81000, Montenegro. The Forma Restaurant: Very Enjoyable Setting and Meal. 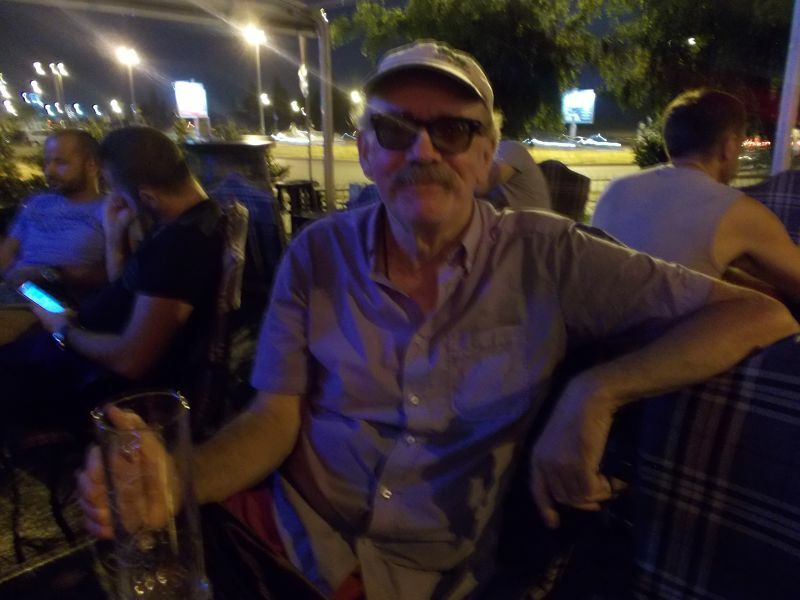 On our first evening in Podgorica we wandered through the new town and found the Forma Restaurant. 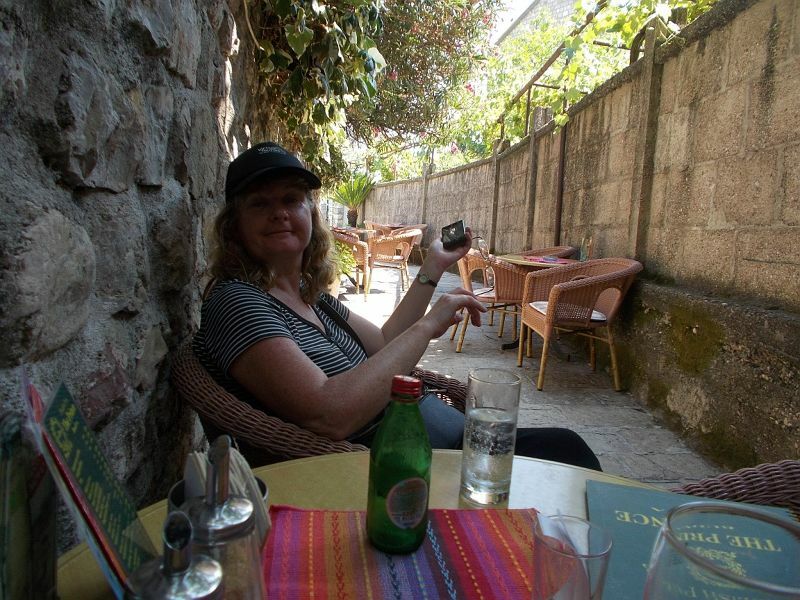 We sat outside the restaurant on a pedestrianized street. We had a very pleasant meal. Peter had four cheeses pizza and I had chicken and vegetable risotto. 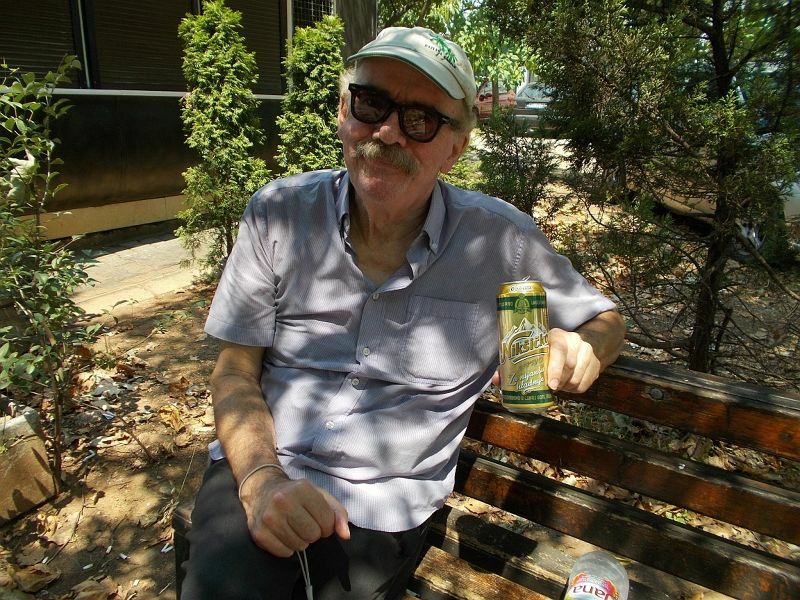 We drank Lav beer ­ unaware that it was Serbian(We had intended to try the local tipple). Service was fine, food and drink were good. Overall cost was cheap. 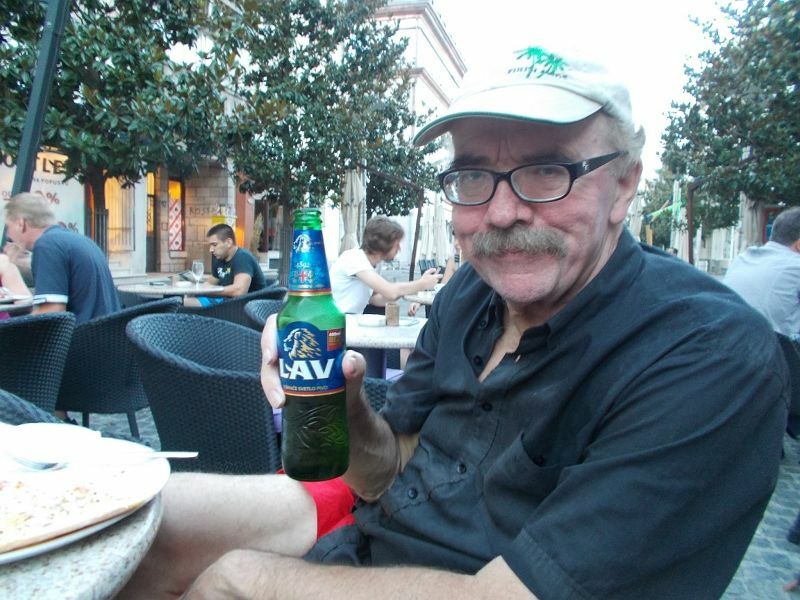 This is the beer of choice in Montenegro and very good it is too. If you can not pronounce it, ask for a Nik. 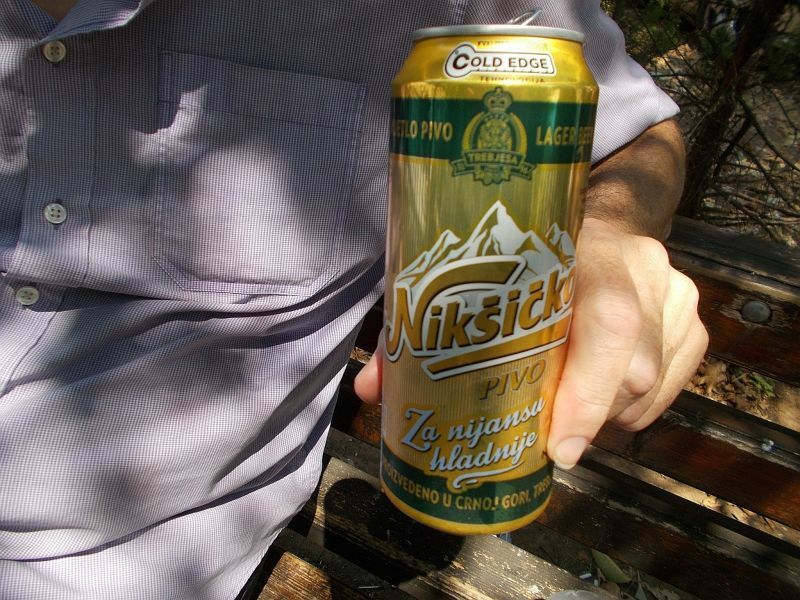 One problem with beer in Montenegro was that in the supermarket you can not purchase a bottle unless you return one. We tried to ask how you got on the bottle ladder if you had just arrived in the country, but people just got angry with us and we never received a satisfactory answer. At one point we saw a crate of empties outside a supermarket and were tempted to steal some, but we behaved and limited ourselves to draft and cans. 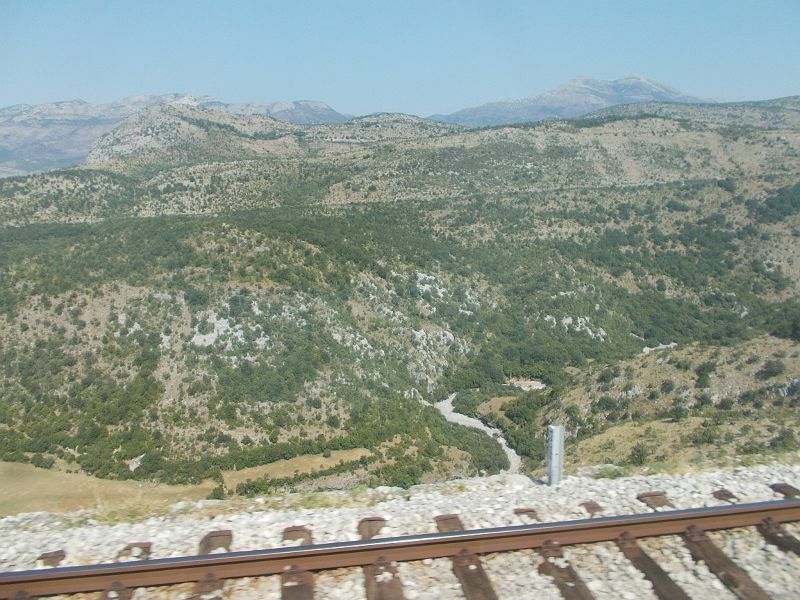 We left Podgorica by train. The station, like the airport, is a disgrace, but that aside the journey was OK. We had comfortable seats. 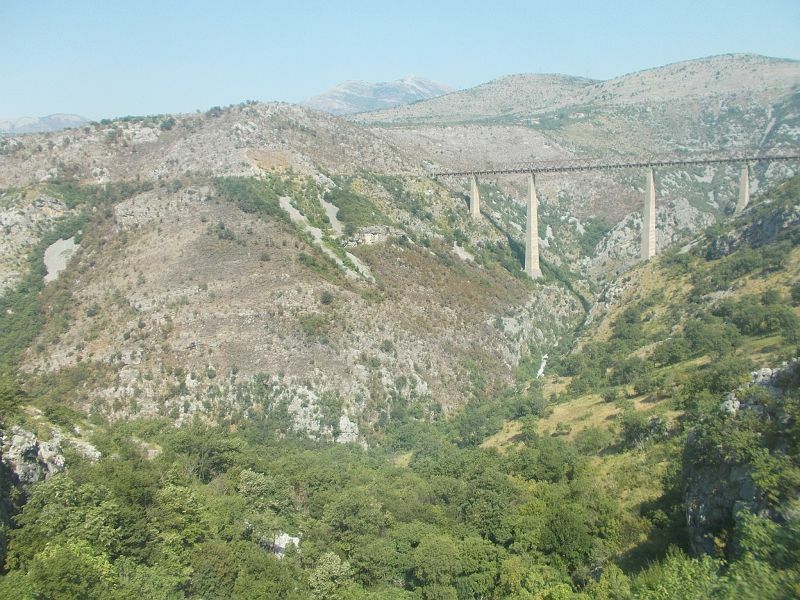 The scenery was beautiful especially in the area around the border with its mountains, rivers and viaducts. The journey should have taken ten hours but in reality took eleven and a half. Arriving in Podgorica by air. We arrived in Podgorica by air. I can honestly say that the airport is a disgrace and gives a terrible first impression of the country. At passport control there is no queuing system. It's like a free for all rugby scrum to get through. Once we got through and reached the luggage belt, we watched as all the luggage fell off it into a heap and the whole belt ground to a halt with its emergency alarm blaring. 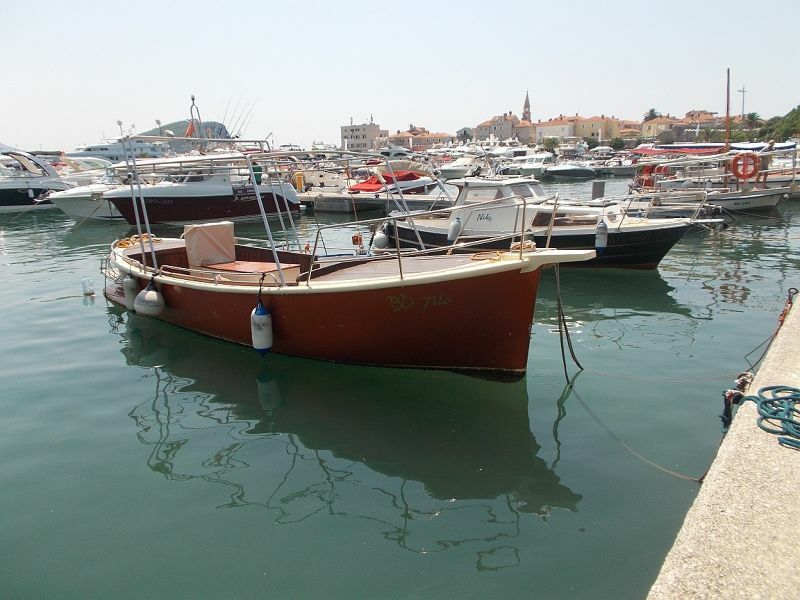 Surviving all that, we got to find there is no public transport into Podgrica from the airport. You have to go by taxi and, as I am sure we all know, airport taxi drivers are generally the scum of the Earth. Podgorica was no exception to this rule. 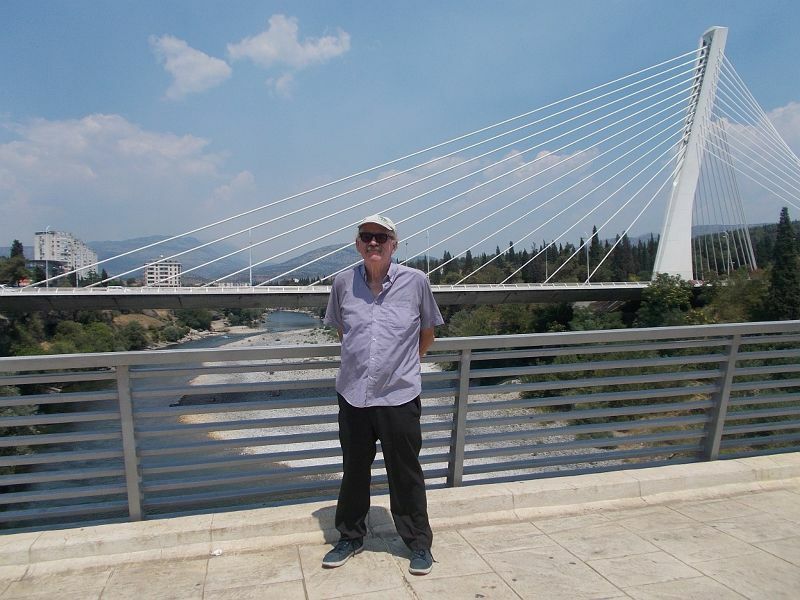 We were told at the airport information desk that a taxi to Podgorica should cost 8 Euros. 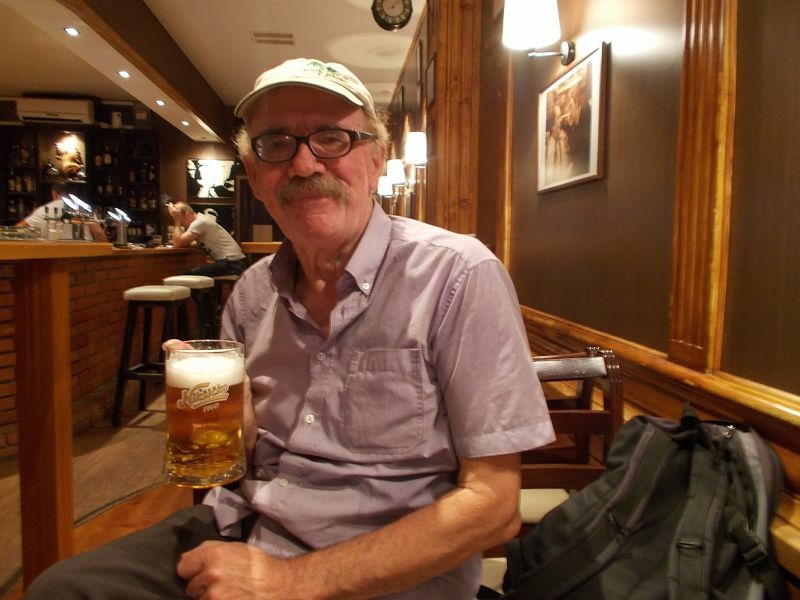 The taxi drivers demanded 15 Euros. When we complained, they turned really nasty and aggressive, screaming that we could get the information lady to drive us into town if we did not like it. A dreadful welcome to any country. A terrible first impression.